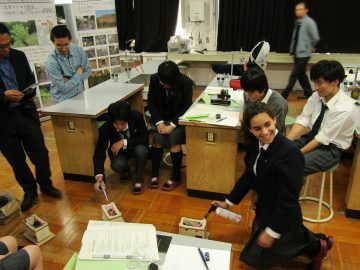 On Saturday 17th February, nine first-year and three second-year SG focused-area participants attended an environment conservation workshop, “plant oaks to pass traditional kikusumi and satoyama to the future”. 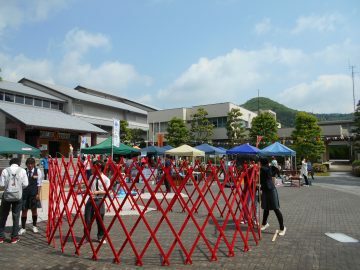 This event was organised by Kikusumi no Sato Nose Satoyama Souzoukan with funding from the Ministry of Agriculture, Forestry and Fisheries, and was attended by 80 people including university students and local residents. At 10am, Yoshitaka Kotani, the director of Satoyama Souzoukan, started the five-hour event with an introduction to kikusumi, a locally-made charcoal which can be sliced into cross-sections with a chrysanthemum-like pattern. 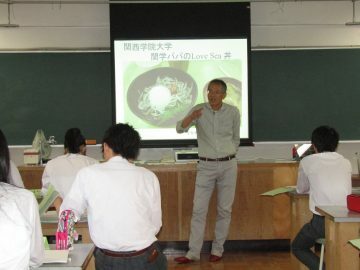 Speaking from in front of their charcoal-making kiln, his lecture contents ranged from important role of kikusumi in Japanese tea ceremony to the heat-radiation qualities of the charcoal, which cooks delicious meat and vegetables deliciously all the way to the centre. He showed us some videos to illustrate his points. 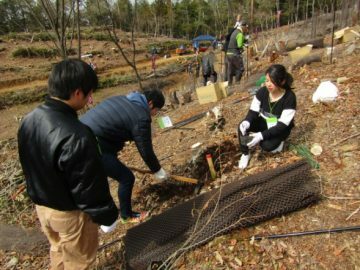 We then spent time planting oak seedlings in Arakidani, which is an area that embraces its satoyama – the harmony of nature and human life. Oak is the material from which kikusumi is made. Groups of three to four people planted seedlings on the slope of the mountain, taking extra care on the slippery surface caused by heavy rain and snow just before the workshop. We planted as many as 200 seedlings over two and a half hours. After the planting session, all of the participants enjoyed talking to each other over curry and rice cooked by a group of volunteers. 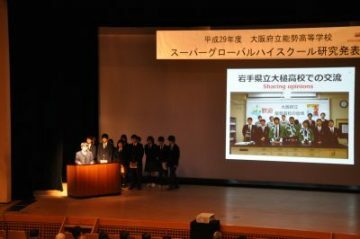 On Saturday 3rd February, we held our 2017 Super Global High School term-end presentation at Nose’s Joruri Theatre. 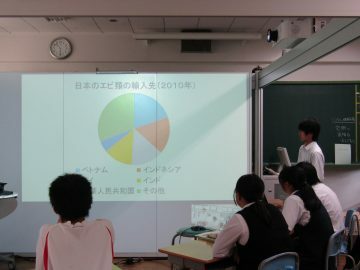 The presentation was a summation of the years’ activities and research. Nose High School was granted SGH status three years ago. Ever since, we have been working on the development and execution of study programmes with a goal: to raise globally-active members of society, and to nurture their management capabilities and judgement in the field of international cooperation. The 2017 SGH research presentation session was the most diverse one so far, building on the successes of previous students’ activities and research. 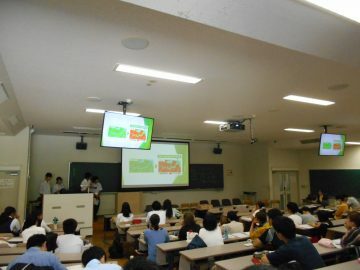 The first part of the presentation session was split into three parts. First was the report of the Rural Innovation Summit of High School Students by three SG focused-area lecture participants. This was followed by a presentation by first-year students on the plans that they developed and entered into a high school students’ business plan competition. 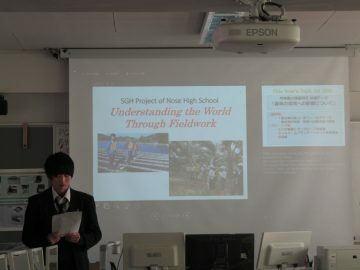 Finally, there was an English-language presentation from second-year students with the theme of ‘Understanding the world through fieldwork’. Although the programme has 13 participants, on this occasion only 12 were present; one student is currently studying at Assunta High School, our sister school in Malaysia. The latter half of the presentation session was dedicated to the research of second-year students. 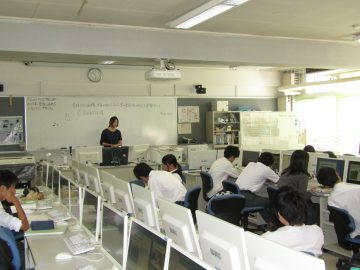 Groups of second years have been conducting their own detailed research on many topics related to both the relationship between Malaysian economic development and environmental degradation, and reconstruction efforts following the 2011 Tōhoku earthquake and tsunami. They gave three presentations: one on local renovation after natural disaster in Tohoku region; another on the influence of prawn aquaculture on mangrove forest destruction; and a third on the relationship between oil palm plantation and rainforest deforestation. In between the presentations, we watched a video that our students had recorded using a drone in Malaysia. We were also treated to an Osakan-dialect manzai comedy performance by two first-year students, in which they discussed serious global issues with light-hearted humour. The students delivered all of their presentations in a way that describes research workflow: developing ideas, conducting fieldwork, raising arguments, and drawing their own conclusions from their work. This proper research methodology – and the passion showed by the presenters – allowed the audience to clearly understand and provoked an enthusiastic response. 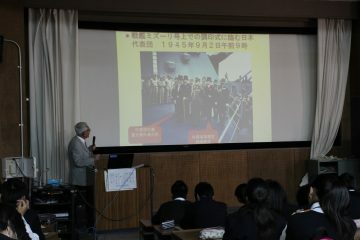 Invited guests were in attendance from all over Japan, and many of them contributed observant and piercing questions. Despite occasionally controversial questions, the students did not hesitate to answer with the opinions they have developed over the course of their SGS research; their growth was clearly evident. We finished the day with students remarking on their achievements during the SGH programme, expressing their gratitude towards local supporters, guest lecturers, and our Malaysian hosts, and finally with some feedback from guests. One of the invited guests, Prof Yoko Inui from Osaka Kyoiku University, emphasised the importance of carefully insight “comfortable” words such as natural conservation as well as keeping a positive outlook on the future of humankind and its relationship with the earth. Finally, we would like to thank the audience of as many as 150 people. Thanks to your continued cooperation and participation, we find ourselves becoming more and more motivated to begin our 4th SGH programme in the academic year 2018-19. The twelve participants of SGS classes delivered their two SGH research presentations in English. 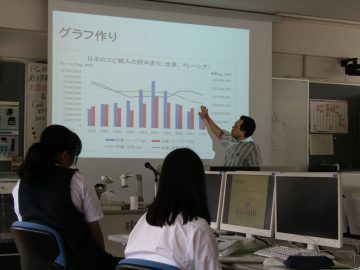 One presentation was on the influence of Malaysian economic growth on environmental degradation. 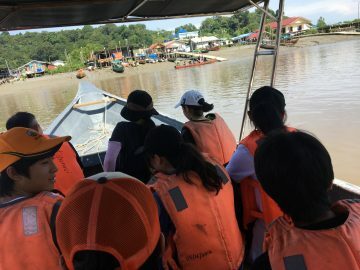 The students included examples from their field research, using the examples of the relationship between oil palm plantations and rainforests, and between prawn aquaculture ponds and mangrove forests. 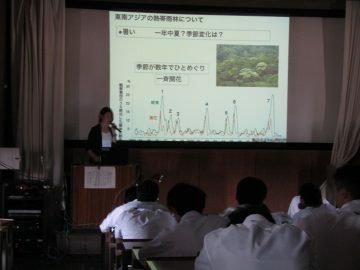 The other presentation was on the recovery from the 2011 Tōhoku earthquake and tsunami. 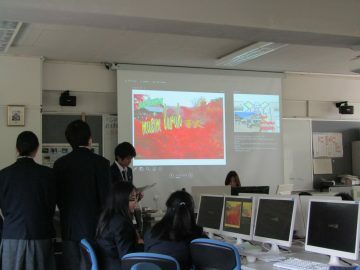 Our students did a great job; the presentations received positive reviews from the university lecturers and students. The students delivered the same presentations at our sister school, Assunta HS. The presentation was part of the programme for the welcome ceremony. It was great to see both teachers and students of Assunta engaged in our presentations. 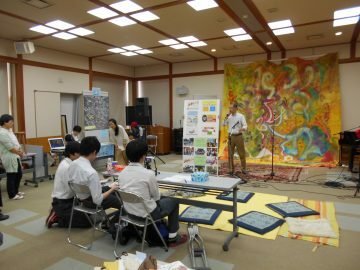 In the evening at the school, we were treated to a performance from four SGS participants, who have been taking an intensive course on kami-shibai – a form of Japanese storytelling using illustrated paper boards. The Assunta students were surprised and delighted by this unexpected encounter with old Japanese street culture delivered in a mix of Japanese and English. We were pleased with our demonstration of this wonderful part of our culture, and the reaction of the Malaysian students gave us a bit of inspiration about the potential of kami-shibai as an international communication tool and a new SGH presentation methodology. 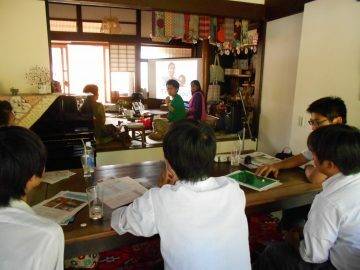 On Thursday 25th January, 14 first-year SG participants visited Minoh Association for Global Awareness (MAFGA). 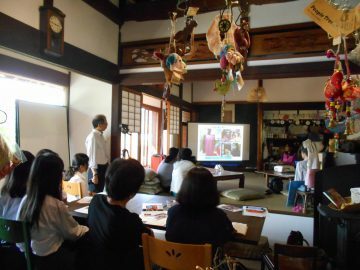 We started the visit with short lectures given by some staff members, then had conversations with non-Japanese residents of Minoh city in the “comm cafe” on the ground floor of the MAFGA centre. 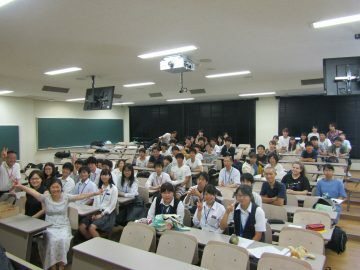 The first lecture was given by centre director Asuka Iwaki. She introduced the flow of globalisation and internationalisation at local level, and MAFGA’s activities in that area. She talked about her own international experience from her time doing an exchange study in Turkey, and everyday cross-cultural communication with her Turkish husband. She also discussed political affairs in Turkey and the countries surrounding it to demonstrate shifts in the international community. 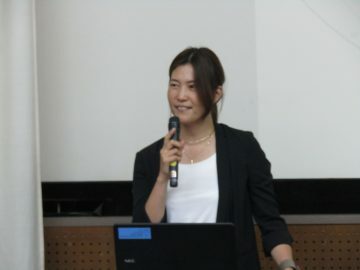 The next lecturer was Prof Ryoko Imaoka from Osaka University. 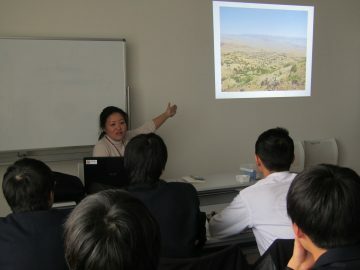 Her lecture was on the subjects of Mongolian culture, nature and geography, and government policy. Mongolia is located on a much higher latitude than most of Japan, is distantly separated from the nearest sea, and has only a small amount of rainfall. These factors caused people there to develop a livelihood and culture based around livestock. Prof Imaoka also introduced some policies of the Mongolian government, focussing on welfare for people living far from cities. She cited a scheme which ensures that there are medical personnel in every rural area, and talked about state-provided financial support for people who are unable to work while they are raising children. After hearing these three talks, we moved to the comm cafe and chatted about culture and high school with MAFGA staff members from Russia, Korea and China and Brazil. comm cafe is an international community café which offers international set meals that change from day to day. 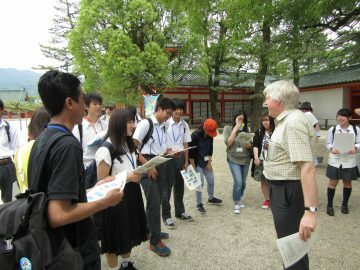 This visit to MAFGA helped our students to gain an insight into the lives of some international residents of Minoh. It was also helpful to learn a little more about Mongolia, as students will be visiting the country next year for their SGH overseas research field trip. The first four classes on Saturday 23rd December saw the Second Years’ 37th and 38th Super Global focused-area lectures. 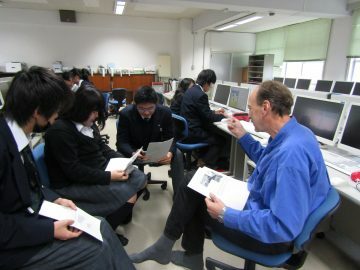 Mr Timothy Kern from Kwansei Gakuin University was with us again to help improve our presentation slides and documents. This is the final SGH class of 2017, with the final presentation session coming – disarmingly quickly – in the beginning of February. Students worked hard on polishing the content, design, and wording of their slides based on feedback from Mr Kern and the guests at the mid-term presentation session. Students are now aware of the importance of using a range of vocabulary to appeal to the listener as well as simply ensuring correct grammar, and the need for easy-to-understand contents. We’re sure that their efforts will bear fruit at the time of the final presentation. An exchange student for six weeks, between mid-December to the end of January. 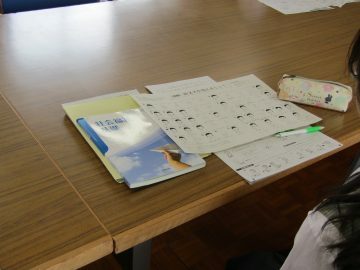 Misa moved to Australia with her family when she was in the fourth grade of primary school. This short stay with us is the first time since then that she will spend time at a Japanese school. 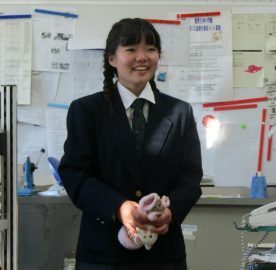 Belonging to the second year of Blackwood High School in Adelaide, she is a trilingual speaker of Japanese, English and Spanish, and now thinks in English. 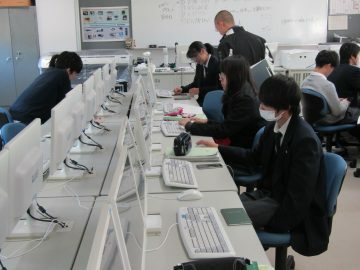 Our students seemed surprised at how different the life of a Japanese student can be, as well as the differences between school life in Australia and Japan. 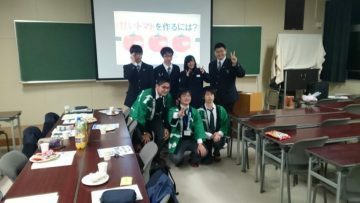 They raised a lot of questions after Misa’s English presentation on Australian school life during the Second and Third Year joint class in English communication. 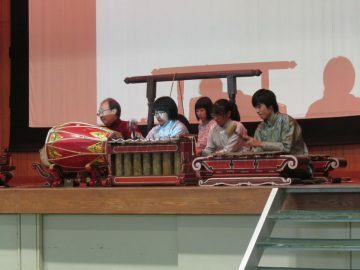 Misa also participated in gamelan practice, which is part of the programme of SGH. She will join the Second Years’ school trip to Malaysia from 21st January, where she will support her classmates as they deliver their presentations, and help out with general communication at Universiti Putra Malaysia and Assunta High Misa　Hirahara, a Japanese student who also has a citizenship of Australia, will be at Nose HS as School, the sister school of Nose HS. 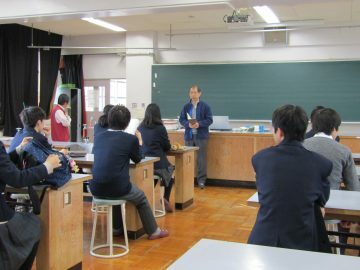 In the first and second SGS classes on Tuesday 5th December, we had the Second Years’ 34th SG focused-area lecture, with Mr Shohei Kotsuji once taking the session, having first visited us in June. 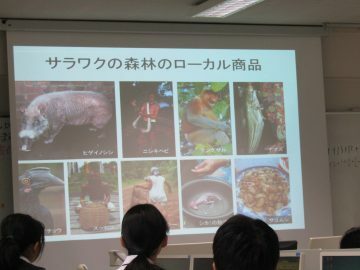 Mr Kotsuji is Director of Corporate Social Responsibility (CSR) in the promotion department of Saraya Co., Ltd.
His lecture today was titled “Malaysian palm oil and RSPO”. RSPO, the main topic of the first half of the class, stands for “Roundtable on Sustainable Palm Oil”, which is a conference concerning world standards for production and supply of palm oil. We heard that the crucial problem is that while the conference has 2879 attendees in the form of countries and corporations from all over the world – including Japan – there are two conspicuous absentees in India and China, the biggest consumers of palm oil. 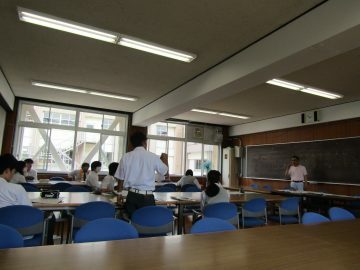 The lecture was followed by a “stakeholder workshop”. 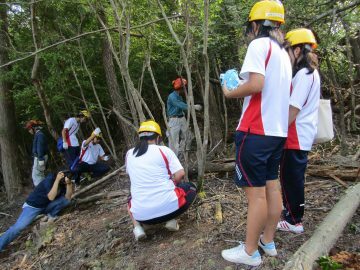 Students formed four groups: product manufacturers; environmental NGOs; forest residents; and plantation owners. Each stakeholder group had to make a stand on the topic of palm plantations based on their own interests. This task helped students to think about the issues and opinions of different people in different positions. Mr Kotsuji ended the session with the advice “Compromising with each other is the most important thing to work on. There is no one correct answer.” That sounds to us like a universal theory for any social issue! Class periods 1-4 of SGS on Saturday 2nd December saw the Second Years’ 32nd and 33rd Super Global focused-area lectures. 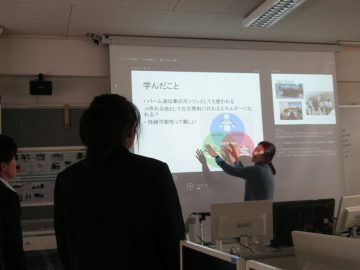 Though it was only the second class after the mid-term presentation, students have already started preparation for the final presentation in February next year. Students flagged areas to work on by recalling drawbacks in their mid-term presentations, and set milestones for improvement based on those aspects. Three groups of students then discussed how to structure the final presentation, in which they will summarise their entire year’s worth of research. On Tuesday 28th November, we welcomed Kaori Hamaguchi to the school to deliver the Second Years’ 31st SG focused-area lecture. Ms Hamaguchi is the manager of the Umeda Tsutaya Books branch of Motherhouse. We were also pleased to have Kento Fujisawa, the manager of the Mint Kobe branch, who helped with the workshop after the lecture. To begin, Ms Hamaguchi gave us an introduction to Motherhouse, talking about the brand’s history, and the difference between their business model and standard fair trade practices. 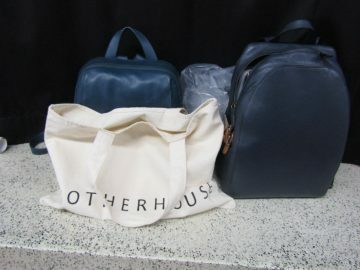 Motherhouse, a Japanese bag brand with the concept “Making products in developing countries with globally-recognised quality”, operates a factory in Bangladesh and produces bags and accessories from locally-sourced jute, or cow leather. They also produce stoles of raw silk in Nepal, and jewellery in Sri Lanka and Indonesia. They are very thorough in making the best of use local skill, labour, and material in all of their production. Ms Hamaguch explained that the difference in their business style as opposed to fair trade is the generation of demand by quality and design, not by relying on representations of the difficult living situation of people in developing countries. She stated the most important aspects of the business: material acquisition and production in the same location, delivering more interest to producers; the ability for consumers to learn about the diversity of the world through the brand; an emphasis on building equal positions for producers and business partners; and the importance of looking for niche regions untouched by other businesses. 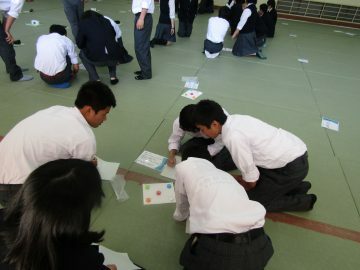 In the latter half of the class, students grouped up in threes to take part in a workshop. Their task was to think about how to raise the value – or “do branding” – of Nose. 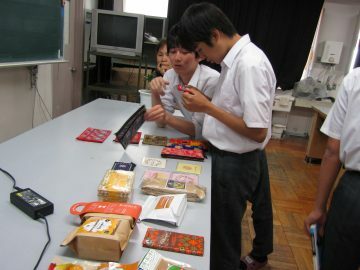 Although it was difficult to think of a product with added value, students generated a lot of creative ideas. Today’s session gave us a look at the very essence of the “Think locally by looking globally” mentality. We hope that this will encourage our students to think more deeply about the revitalisation of Nose. On Wednesday 22nd November, we held the SGH mid-term presentation session in the school gym. For the opening ceremony, we were thrilled to welcome MargaSari, a gamelan performance group based in West Japan. Our students had a chance to play the instruments together with them. Next on the agenda was the keynote speech from Professor Shin Nakagawa of Osaka City University. The theme was “Coexisting with different cultures in the era of global communication”. 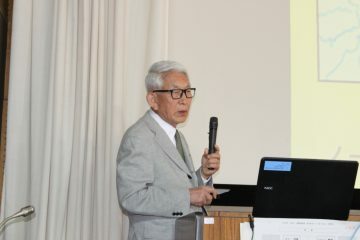 Prof Nakagawa suggested that Japan is on a trajectory of globalisation with frequent and increasing interaction with different cultures, and said that living alongside the world requires global communication. After the speech, it was the time for our second-year students’ presentations. First, the SGH participants delivered an English presentation introducing Nose and SGH. Following that, we heard several reports of research field trips. 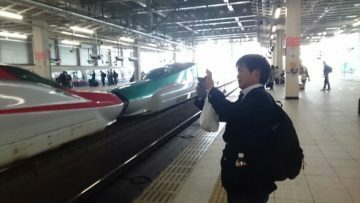 The first was on the domestic trip to Kesennuma, Rikuzentakata and Otsuchi, followed by two reports from overseas trips on the topics of “The relationship between prawn aquaculture and mangrove destruction”, and “Rainforests and oil palm plantation”. Finally, a group of third-year students delivered their presentation “Costa Rica’s payments for ecosystem services: suggestions for environmental conservation in Nose”. 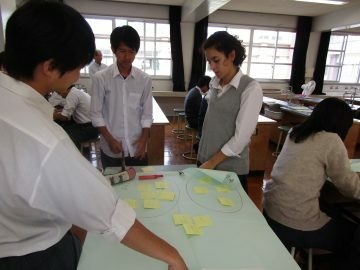 The theme was developed based one of the students’ experience on an exchange programme in Costa Rica. On the morning of Tuesday 21st November, we had the 31st SG focused-area lecture. 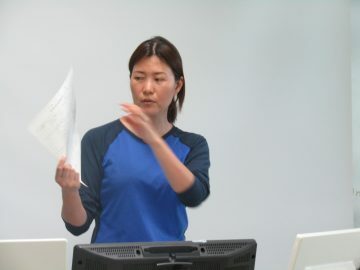 Following her previous lectures, Yoko Inui, associate professor of Osaka Kyoiku University, oversaw our students’ final preparations for tomorrow’s mid-term presentations. Prof Inui’s 4th year student Katsutoshi Omae was also on hand to help out. They gave lots of feedback after each group did their rehearsal. Feedback included advice on presentation skills, slide layout and font design, how to keep phrases short and to the point, and clarification on what the word “entire” implies. On the contents of the presentations, they picked out the undefined words ‘normalisation’ and ‘globalisation’, and the concepts of ‘natural’ and ‘aqua-cultivated’ prawns. 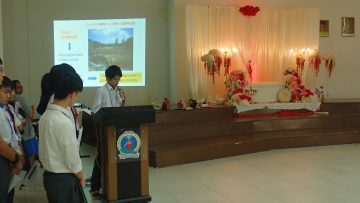 In addition to this feedback, they voiced their appreciation of the students’ focus on sustainability in the presentation of “Rainforests and oil palm plantation”, adding the difficulty in realising the feasibility of dual uses for fuel and food production from the same plant, as the failure of such attempts with corn has shown, despite the volume of research that is currently underway with plants such as algae. This was the final SG class before the mid-term presentation. Our students are confident that their hard work and efforts this term will enable them to deliver their best presentation yet. Four class periods on Saturday 18th November were given over to the 29th and 30th SG focused-area lectures. Today’s session was run by Mr Timothy Kern from Kansei Gakuin University, who is also supporting our after school preparatory classes. 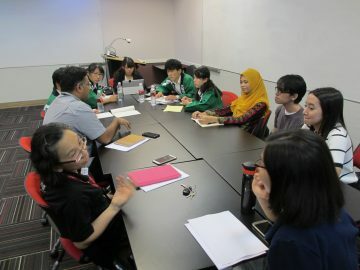 Students split into three groups, focusing on the topics of “Mangrove forests and prawn aquaculture ponds”, “Rainforests and oil palm plantation”, and “Oyster farming and recovery from natural disaster”. They are currently working on the final step of the mid-term presentation, and in these classes they summarized the contents they have developed on their topics, based on feedback from Mr Kern. They then moved on to another presentation, “Introduction to SGH classes and activities in Nose town”. 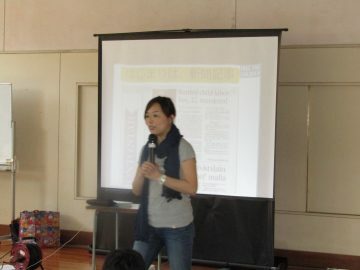 Today’s session saw a particular focus on making sure that the English in their presentations is natural and polished. Wednesday 22nd November is the day of the mid-term presentation. We will also be treated to a keynote speech from Professor Shin Nakagawa of Osaka City University. It should be a big day for our students. On Wednesday 15th November, we were pleased to welcome Katsuhiko Ogino, former chief board member of Minoh Association for Global Awareness (MAFGA), to deliver our 6th SG basic knowledge lecture. The topic today was “race problems and human rights in the USA”. Mr Ogino told our students of his own experiences during his 6-year stay in the USA working for a Japanese medical manufacturing company. 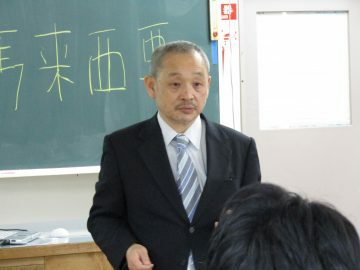 Taking examples of discrimination against African Americans, Mr Ogino lectured on the different methods of managing a factory in a multiracial and legality-oriented, low-context society. He also pointed out some contradictory faces of the United States: racial discrimination remains despite the proclamations of freedom and equality; plenty of opportunities exist for talented people, resulting in the country being the world leader in charitable donations, GDP, and Nobel Prize winners; and an environment which cherishes individual abilities and uniqueness. Organizing a workshop for the latter half of the session, Mr Ogino emphasised the importance of language capability, logical thinking, understanding of different cultures, generosity, and confidence in one’s own personality and ideas. 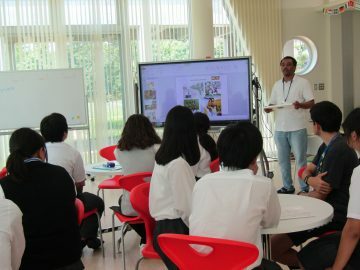 After hearing his tips on international and cross-cultural communication, groups of students read various pre-prepared cross-cultural situations and discussed how they should behave in each one. Today’s experience should be useful in everyday communication in the future. Today’s lecture encouraged our students to think about how to get along with people from diverse racial, religious and cultural backgrounds. On Tuesday 14th November, we held the 28th SG focused-area lecture. 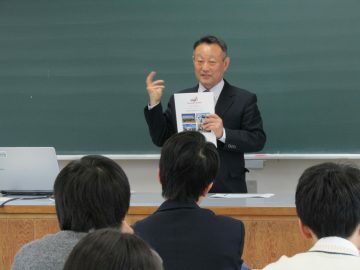 Yoko Inui, associate professor at Osaka Kyoiku University, was on hand to help students polish their mid-term presentations on their research topics. Keeping this advice in mind, two groups of the students from the overseas trip discussed the contents of their presentations on the subjects of “mangrove forest and prawn aquaculture ponds”, and “rainforests and oil palm plantations”. Brainstorming on issues they found on the trip resulted in the new realisation that local people do not think that biodiversity loss due to forest destruction is an issue closely related to them. 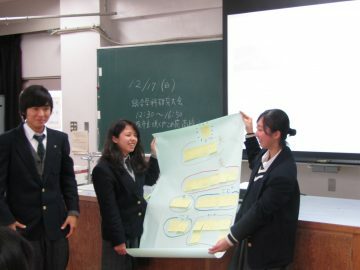 The students from the domestic trip introduced an idea from the mayor of Rikuzentakata, who had told them about the normalization of town planning in the reconstruction of that earthquake-damaged area, and oyster cultivation activities run by the environmental NGO Mori wa Umi no Koibito in Kesennuma. 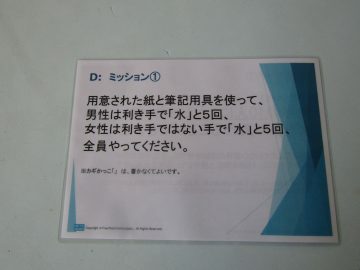 As they were relaying these thoughts, Prof Inui advised them to compare the differences, for example, between oyster cultivation in Kesennuma and Kansai. The presentations should be informative and original, as students are now trying to go beyond simply listing what they did on the trip, but rather incorporating how they felt, their personal thoughts, and their analyses into their writing. On Saturday 11th November, we held the 26th and 27th Super Global Studies sessions during the first and second class periods of the day. Today, we were pleased to welcome to the school Mr Toshiyuki Saito, a community revitalisation manager, who had previously given us a lecture and a workshop in May this year. This time, Mr Saito’s topic was about applying knowledge acquired through SGH lectures to local community, as well as tips and feedback on making a good presentation. In the first class, students built the structure of their essays on the topic of their domestic and overseas research trips. 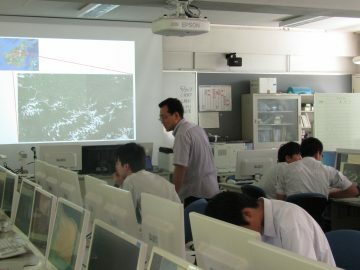 The essays had three main focuses: the condition of sites they observed, issues to be tackled, and planning a solution. 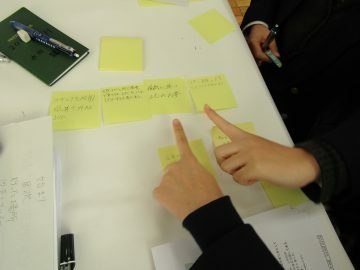 Mr Saito encouraged students to use large sheets of paper and sticky notes to organize their experiences and ideas in the form of flowcharts and categories, to help them make their arguments clearer. After this, we split into three groups focusing on the three topics of “mangrove forests and prawn aquaculture ponds”, “rainforests and oil palm planations” and “recovery from the natural disaster and oyster cultivation”, and started to write about their topics with feedback from the lecturer. On the morning of Tuesday 7th November, we held the 25th SG focused-area lecture in the LAN classroom. This was the first class since last week’s overseas research trip to Malaysia. Our goal from now on is to prepare for mid-term presentations about each group’s topic. Today, we selected and sorted pictures taken in Malaysia under categories including prawn aquaculture, oil palm plantation, and university visits. Group discussions followed, in which students talked about their presentation structures using those photos. 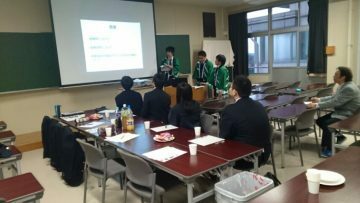 With the continuous support that we have been receiving from Mr Takanari, a fourth-year student of the Department of Biological Science at Osaka University, our presentation construction proceeded smoothly. 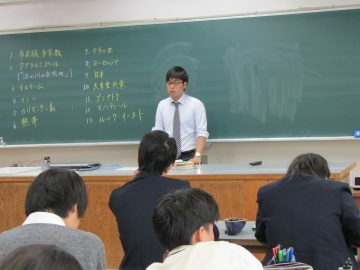 Mr Takanari has been assisting us since the first term of this school year. In order to be able to quickly prepare for the already imminent mid-term presentations, we are going to write the draft in the next SGS class, ensuring that we include plenty of our personal impressions and the knowledge that we gained from our first-hand observations on the field trips. Our last day in Tohoku started with an early-morning visit to Mr Futoshi Toba, the mayor of Rikuzentakata city. We were pleased to have a chance to tell him about our SGH activities. Over our ninety-minute meeting, he explained a variety of the city’s policies, such as the reconstruction of damaged areas, including citizens in decision-making, and his resolve to create a naturally and pleasantly barrier-free city called “Normalization”. 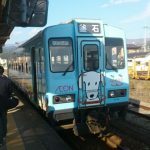 We then traveled to Otsuchi town, taking the bus and the Sanriku Railway Minami-Rias line, which runs along the coast. 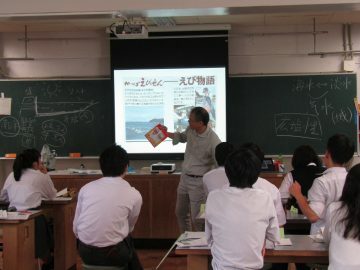 This allowed our students to learn first-hand the complexity of the East Tohoku coastline. On arriving at the town, we were very warmly welcomed at Otsuchi High School. 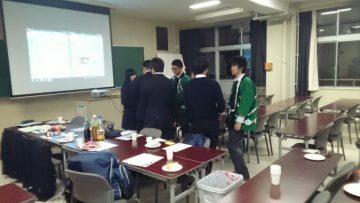 After student committee members came to meet us, students from both schools gave a presentation about their school and its activities, and we had some free time to chat to each other. Learning about Otsuchi High School’s activities in the earthquake-damaged town had quite an impact on us, and motivated us to think more about how we can improve our activities towards helping local communities. At 5pm, we met another official: Mr Kozo Hirano, the Otsuchi town mayor. 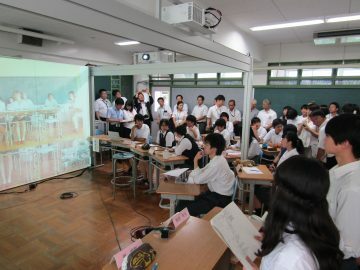 Once again, over the course of over an hour, we introduced our SGH activities, and learned about the reconstruction of Otsuchi with a view to keeping its local uniqueness, and about the contributions of the students of the local schools. The people in Tohoku were extremely kind. Even the owner of an inn we stayed at, Ogawa Ryokan, talked about the earthquakes and tsunami in 2011, and about people’s hopes for reconstruction and social recovery. We will head back to Osaka tomorrow having learned a huge amount through direct accounts of local residents. We started the second day as early as 6:30am with a walk, to have a glimpse of how far the reconstruction process has progressed in the area. After breakfast, we visited the Moune Institute for Forest-Sato-Sea Studies, which is run by the environmental NGO Mori-wa-umi-no-koibito. We boarded an oyster aquaculture raft, where we heard about oysters as living creatures, as well as how to grow them, what kind of plankton they eat, and what kind of creatures coexists at oyster aqua cultivation. We then moved to Kukunakihama beach to learn about its large tidal circulation. 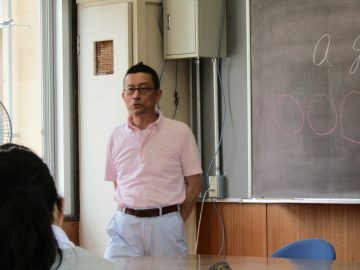 At the research centre, Prof. Hatakeyama, the founder of the NGO, gave us a lecture about the relationships between the sea, the forest, and human beings. At the end of this productive morning, we moved to Mt. Yagoshi, where we heard a talk on the methods and purpose of tree planting in the local area. 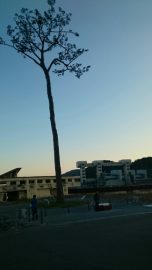 We rounded off the day with a visit that left an impression: Rikuzentakata’s “miracle pine” – the only pine tree in the area that survived the tsunami. Today is the first day of the SGH research field trip to the Tohoku region of Japan. 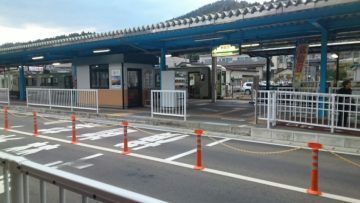 We departed Itami Airport for Sendai at 10am, and hopping between various shinkansen and local trains, we arrived at our first destination, Kesennuma, after six hours of travelling. 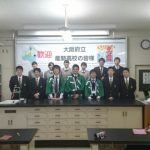 We headed to Kesennuma High School, where we were welcomed and shown around by its students. 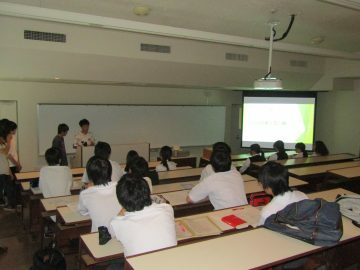 After introducing ourselves, we gave a presentation about Nose and Nose High School. 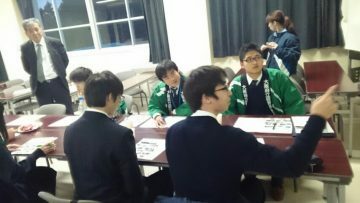 The Kesennuma students then talked about their school, and we had ninety minutes to chat casually with our counterparts. 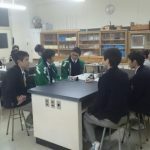 It was great to hear that Kesennuma HS contribute to the activities of environmental NGO Mori wa umi no koibito, which we have been researching and will visit tomorrow. Those ninety minutes flew by, and were all too short to spend talking to our new friends. Before finishing our fun trip to the school, we took group photos and exchanged contact details. Time flies when you’re having fun; it is already the sixth and final day of our research trip in Malaysia. We left the Pullman Kuching Hotel at 8.45am to visit Swinburne University, which is located in Kuching’s city centre. 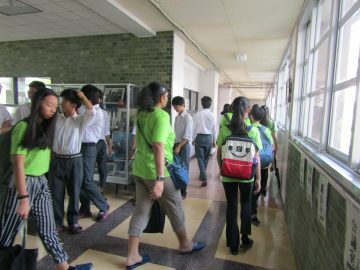 As we arrived, we admired the university’s spacious campus and modern buildings. We were welcomed by the coordinators Veronica and Tana, and they gave us the campus tour. 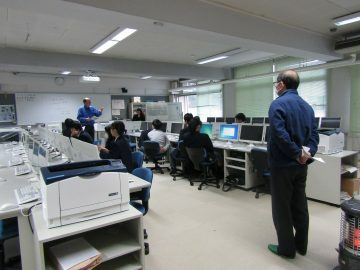 We visited the chemistry and robotics laboratories, and heard a little about the research taking place there. We saw a crane robot for oil palm fruit collection in one mechanical engineering lab. University librarian Ms.Khursiah took over the tour at the surprisingly large library. After an hour of being shown around, we moved to a meeting room to deliver our presentations. 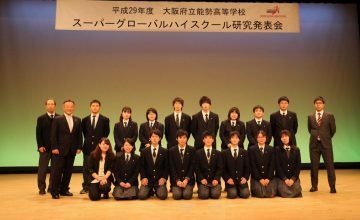 Throughout our presentations and Q&A sessions, we wore a traditional Japanese Happi jacket adorned with the Nose High School logo. Our sessions were attended by an applied linguistics researcher from Myanmar, Mr.Khin Khin along with quite a few other lecturers and students from the university, so we were very motivated to perform and felt that all of our practice had been rewarded. After the session, we wanted to continue our fun, challenging experiences in this vastly different linguistic and cultural situation, and so our students went for lunch with university students. There were many varieties of food on offer the cafeteria, and we enjoyed choosing our favourites. After this packed session, we took a group photo with everyone involved, and the two coordinators accompanied us on our way out of the university. After enjoying a last shopping session at a shopping mall and bidding a fond farewell to our guide and interpreter Alex, we headed for Kuching International Airport. We settled into our night flight home to KIX via KUL, with the memories, experiences, and knowledge we’ve gained from this long and fruitful trip still glowing warm in our hearts. 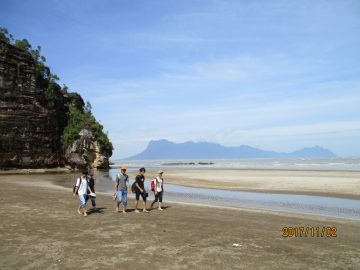 On the fifth day of the overseas research trip, we left the hotel at 8.30am and took a bus to Bako National Park. After 45 minutes on the road we arrived at Bako village, the gateway to the national park. From there, we had to take a boat to access the park on the tip of the peninsula. The short boat ride was a bit of a thrill. It was a little rough and the boat shook as it moved (we had our life jackets on! ), and mangrove forests on both sides gave us a beautiful view. 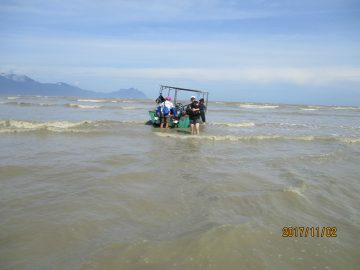 The high waves splashed up the sides of the boat and soaked us, and we had to take off our shoes and walk 100 meters to reach the beach because the boat could not get any closer thanks to the ebb tide. Just after the arrival, we had a surprising encounter with a family of silver leaf monkeys. We were given an explanation of the mangrove forests and the geography of Bako National Park by our guides Alex and Yudi, and headed to the park office to register for the jungle trail for our tropical rainforest research visit. We encountered quite a few animals in the park, including a Bornean bearded pig, a couple of (highly poisonous) temple vipers, a common water monitor, two proboscis monkeys – one walking on a tree, another milling around the park office – and a group of crab-eating macaques blocking our path at one stage. 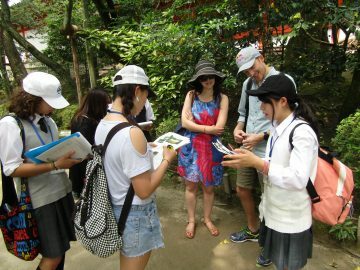 With Alex’s guidance and explanation, our students learned about the unique flora ecology and the food chain in the forest. We took photos as a record as we went around. As we moved deeper through the rainforest, we encountered up close our real point of interest for the first time: the mangrove forests lining the coast. After the tour, we went back to the office and had a Malay lunch on the cafe terrace. By the time we left the park the tide had come in, allowing us to board the boat at the beach. The trip back was equally rough, and we got soaked again. Save for a good drenching or two, the whole day’s activities went off without a hitch, and we were soon safely back at the hotel for a bit of rest and relaxation. To round the work day off, we had a meeting to finalise the plan for tomorrow’s visit to Swinburne University of Technology, and got in a bit of practice for our English presentations. Our dinner venue for the night was the food court of the shopping mall Spring. Each student chose from a variety of Malay, Vietnamese, Thai, and Korean foods, giving them another little cross-cultural experience. Tomorrow is the final day of our Malaysia trip. We are already excited for the presentations and discussion session at the university. 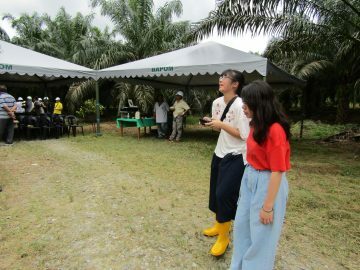 At 8am on November 1st, we left our Hotel, the Pullman Kuching, for Bau Palm Oil Mill. There, we were welcomed by estate manager Mr. Dabllin, PR worker Ms. Marcela, and other many of staff members. Our students signed the visitor book, received a welcome speech, listened to safety instructions, donned helmets, and started for the plantation site. Oil palm researcher Martin gave us a talk on the palm’s growth process, different varieties of palms, their pollination, fertilisation, and the current conditions of the plants. On arriving at the plantation, we heard a more detailed explanation of the trees themselves. We saw how to cut and collect oil palm fruits, using carts to transport bunches weighing 20-30kg apiece. We finished our visit to the plantation with some aerial drone photography, coconut juice, and bananas, before moving to the mill. We heard a talk on the mill from vice-director Mr. Aizer, and wearing safety shoes, masks, helmets, and ear plugs, we started the factory tour. It is a large factory, and the whole tour from the fruit delivery area to where the oil is extracted took us about half an hour. After having lunch with mill staff, we had a Q&A session in the conference room. The staff members present were very generous and patient in answering any and all of our students’ questions. The next destination was an small farmer’s palm plantation for an interview. We had asked the farmer’s niece to take us to the plantation where the farmer was waiting, but we had to cancel the plan because of heavy rain on the way. It took us a long one and a half hours to finally get back to the hotel, at which point we were hungry and exhausted. Thankfully, our dinner for the night was the local speciality, coca steamboat, served at the River Palace Coca restaurant. Tomorrow we are visiting Bako National Park for rainforest observation. On Tuesday October 31st, we left the hotel Istana at 8am and headed for Universiti Putra Malaysia (UPM). We arrived at the campus of the Faculty of Agriculture, and were welcomed by the coordi-nator for our visit Ms.Mardewee and a few of his stu-dents. Ms.Mardwee, who specialises in French, introduced his fellow lecturers Mr.Abdulah and Mr. Khanif. Mr.Abdulah and Mr. Khanif gave us lectures entitled “Shrimp Farming and Mangrove Forest” and “Sustaina-bility of the Malaysian Oil Palm Industry” respectively. 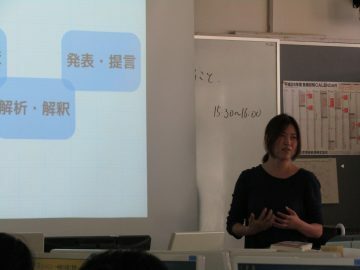 The lectures were interpreted by locally-based translator Junko Yanagisawa. Following the lectures, it was time for our students to shine. They gave a presentation in English about the town of Nose and our high school, the SGH programes, and previous classes and re-search trips. 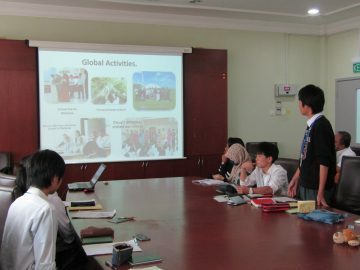 Those presentations were followed by group discussions with UPM students and Nose HS students. We all had lunch together, and left the university for KUL airport. Saying goodbye to Peter, our guide for the first three days, we flew for Kuching, Sarawak, at 5pm. Our arrival was at 6:40pm; it was already dinner time. We had dinner at Bukit Mata Seafood Centre on the way to our hotel, the Pullman Kuching. Our third day ended with a meeting at the hotel. At 7.30am on Monday October 30th, our eight travelling students and accompanying teachers left the Hotel Istana, and headed towards the village of Changkat Keruing in Manjung District, Perak. 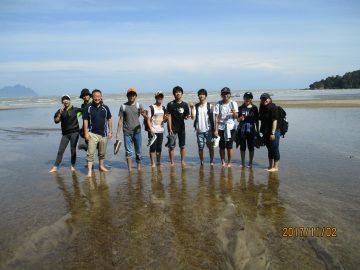 Our activities there were to include observation of mangrove forest and prawn aquaculture sites. It was interesting to watch the rapid change in the scenery: just one hour out from our hotel in central Kuala Lumpur, we were surrounded by vast palm oil plantations. The trip took three and a half hours, with a couple of rest stops. Upon arrival at the village, under the clouds in the 30 degree heat, we met our coordinator Mr.William Won at a restaurant. He explained the history of prawn aquaculture, its current condition, and the issues that it faces today. We then moved to the site to see the aquaculture ponds, and to have a chance to speak to the owner and employees of the facility. They took us to two different ponds – one for black tiger prawns and one for king prawns (whiteleg shrimp) – answering our students’ questions along the way. We found out about how the ponds are constructed, how the prawns are grown, and how to prevent disease in the prawns. 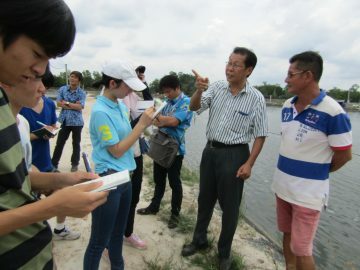 We were surprised to see that an area which had been mangrove forest as recently as August, when some of our teachers visited the same site for school trip planning, had been transformed into a new aquaculture pond. The staff at the cultivation site were generous enough to let us take aerial photos and videos using a drone to help us study the geography of the area. 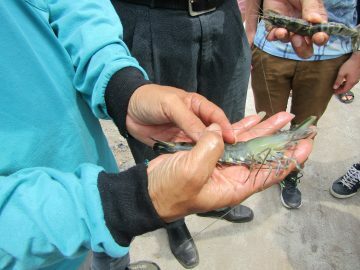 The owner of the site also caught live prawns with a small net and let the students hold them. We took those prawns back to the restaurant, and had a taste comparison test with wild prawns. We departed the restaurant at 3.15pm and headed back to Kuala Lumpur, experiencing heavy squalls several times along the way. After arriving at the hotel, the students went for a walk around the city. They were delighted that they had time for a mini-reunion with four students who had visit-ed Nose High School through a OISCA Malaysia programme in August. Our dinner for the night was at Jalan Alor, one of the most popular food street vendors in Kuala Lumpur. Tomorrow, we will deliver English presentations at Universiti Putra Malaysia, then move on to Ku-ching. This morning at 8am, with a mix of excitement and nerves, eight participants of the SGH on-site research trip gathered at Kansai International Airport. They departed Japan for Kuala Lumpur at 9:55am with Malaysia Airlines, and arrived at 4:10pm local time. They took a bus to the city, and ate dinner at a local Nyonya restaurant. 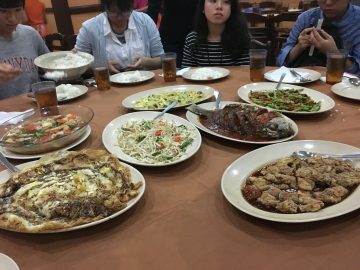 Nyonya – or Peranakan – is a fusion style of Chinese and Malay cuisine, which our Japanese students enjoyed very much! 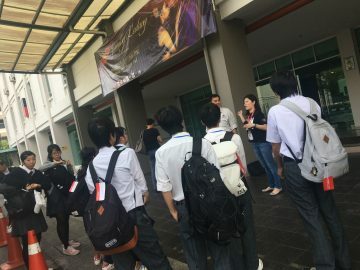 At the end of the first day of their trip, they practiced their English presentation at their accommodation, Hotel Istana. Tomorrow, they will visit a mangrove forest and a prawn aquaculture site. On the morning of Tuesday 24th September, we held the 24th SG focused-area lecture. 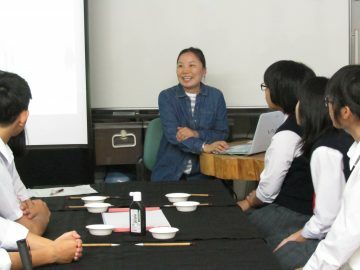 Following her lecture two weeks prior, Yoko Inui, associate professor at Osaka Kyoiku Universiti, gave more instruction on our students’ research projects. Our domestic and overseas research trips are fast approaching, so we spent the lecture summarising and organising our interview questions. Prof Inui told us that we need to make our questions clear enough that people of any background can understand what we’re trying to ask. 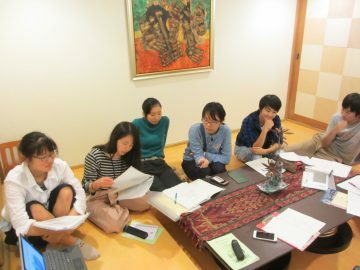 Taking guidance from Nomin, our short-term Mongolian exchange student, and Su Yee, a Malaysian with a high level of English ability for various situations and environments, students translated their questions for the overseas research into English. For domestic research, Prof Inui emphasised that we do not miss the chance to get to know the reality of the local areas. She suggested that we question the local leaders – the mayors of Otsuchi and Rikuzen-takada – on where they prioritise the recovery of administrative areas, or what kind of policy the administration has for environmental conservation. 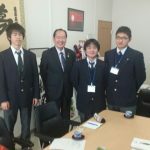 She also said that it is important to raise “simple and frank” questions that high school students have licence to ask without hesitation – a privilege that many others do not possess. 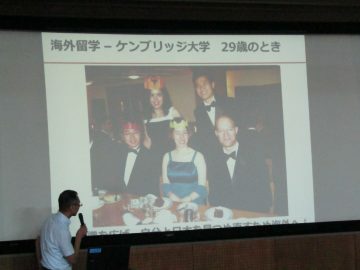 To finish, we had the overseas research team rehearse their presentation. 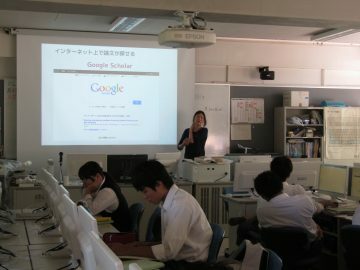 Ms Inui proposed improvements in the details of the presentation such as the font size, and recommended that the presenters show more passion in conveying their argument to the audience. On the morning of Tuesday 10th September, we held the 21st SG focused-area lecture. 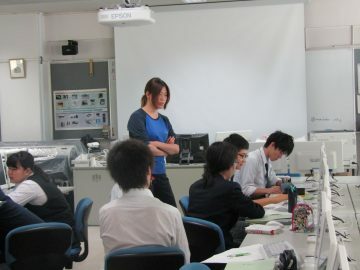 Yoko Inui, associate professor at Osaka Kyoiku University, instructed our students on their research projects. 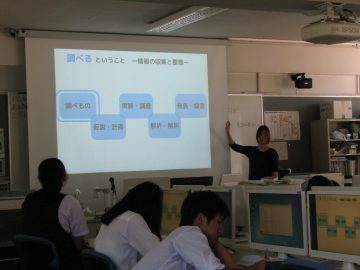 In her previous class, Prof Inui told the students to organise an interview plan for the domestic and overseas research trips as homework. 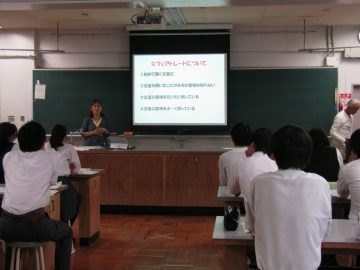 In this lecture, she helped them to make the questions more meaningful and sophisticated. Prof Inui suggested that we should ask clear and factual questions, and prepare follow-up questions in advance by thinking about what kind of answer they would expect to receive. 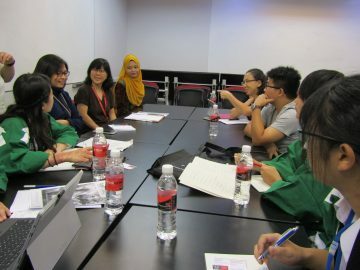 Students made three groups and discussed what kind of interview questions they would ask when interviewing three different groups of people: prawn aquaculture site and palm oil small farmers; students of University Putra Malaysia and Swinburne University of Technology Sarawak Campus; and palm oil plantation and oil factory employees. After the interview preparation for the overseas trip, we worked on next month’s domestic research trip to the Tōhoku area. Prof Inui talked about her own research experience which she conducted for ten months just after the Tōhoku earthquake in 2011. The impressive part of her story was the resilience of the natural ecosystem: biomes of sea creatures recovered within one year, while local human residents are still unable to live a normal life even today, six and a half years since the disaster. She also told us that Japan, as an island country, is particularly severely affected by the damage caused to the ocean ecosystem by natural disasters and related human activities. In order to really benefit and generate sustainability in disaster recovery and further economic development, we need to consider the bigger picture of recovery from a natural disaster, as opposed to a recovery only within the scope of human social relationships. 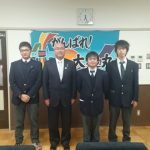 Students took what they heard seriously, and they worked what they learned into their interview questions for the mayors of Rikuzen-takada City and Otsuchi Town in Iwate. On Wednesday 5th October, we had Prof Yoko Inui from Osaka Kyoiku University to deliver the 5th SG basic knowledge lecture. 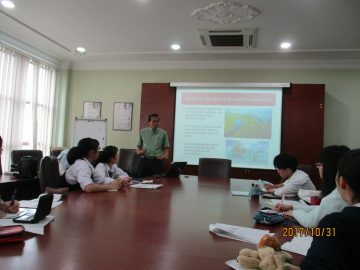 The topic of the lecture today was the ecosystem of the Malaysian rainforest. We also had visitors from the Ministry of Education, Culture, Sports, Science and Technology. 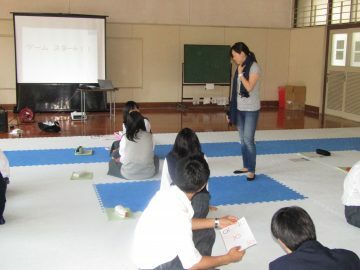 We were glad to have offered the visitors a chance to experience our guest lecturer’s interactive lesson. In the lecture, we learned that rainforests in South East Asia have, from a global and historical perspective, a long life and high biodiversity. Thanks to the especially hot and humid year-round climate, The Borneo forest is one of the tallest seen in the world. However, human activity – including the creation of oil palm plantations and the forestry industry – has severely damaged the rich diversity of the ecosystem: rainforests have shrunk drastically, and animal species have become extinct. Shockingly, most of the virgin forest in Malaysian national parks has already disappeared. What can we do to protect these precious rainforests? This was the problem that the students considered as they asked questions during and after the lecture, including what they should ask at the research trip to Malaysia next month and at the school trip next January. In the first two lesson periods of Saturday 30th September, we had our 20th SG focused-area lecture. 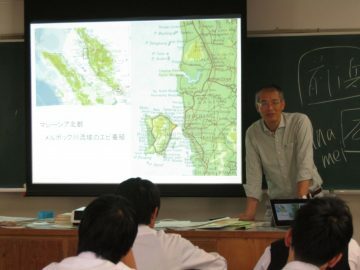 It is only one month until our domestic and overseas research trips, so we used this lecture to revise the purpose and fine-tune the plan of the research trip, and to learn more about our destinations: Kesennuma in Japan’s Miyagi prefecture, and Malaysia. 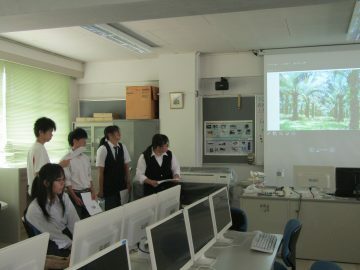 On the domestic side, students learned about the recovery of the Miyagi area from the 2011 Tōhoku earthquake and tsunami, watching videos and PowerPoint presentations about the activities of the Kesennuma NGO “Mori wa Umi no Koibito” following the disaster. 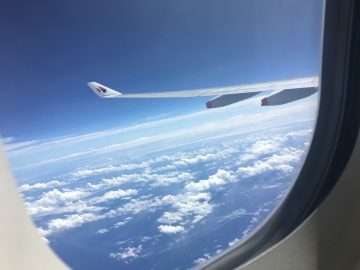 For overseas research preparation, students looked through pictures from the teachers’ preparatory trip to Malaysia in August, as well as learning the location of the fieldwork, the interview method to be employed, and about collection of resources. 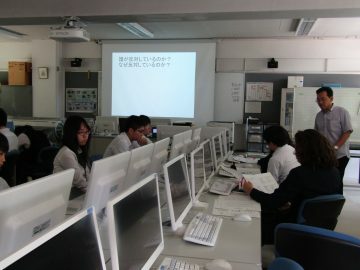 Finally, a workshop was organised in order to plan questions for the interviews. 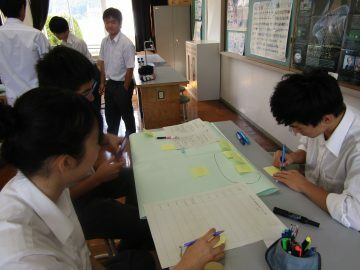 Using sticky notes and a big sheet of paper on the wall, students had a brainstorming session. By the end of the class, the paper was filled with memos filled with many ideas. The preparation for the research trips continues. On Tuesday September 26th, we held the 19th SG focused-area lecture for the second-year students. 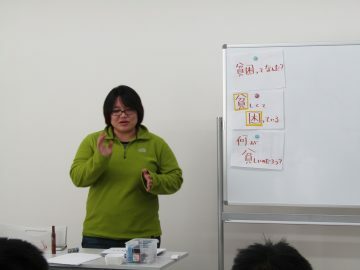 Continuing from last time, today’s lecture was given by Yoko Inui, an associate professor of Mathematical and Natural Sciences at Osaka Kyoiku University’s Department of Arts and Sciences. Prof Inui is guiding us with our research project: “Economic development and environmental destruction in Malaysia: Mangroves to shrimp farms; rainforests to plantations”. This time, Prof Inui gave us a lecture on how to gather and organise information. She explained to us that ‘researching’ includes selecting a research topic, obtaining information, writing a hypothesis, investigating, analysing, and announcing the results of your work. We learned that there is a big difference between simply studying how to find the answers to problems, and researching, in which we need to find questions that we need to answer in order to understand a topic. We also learned things that we need to bear in mind when using the internet for research, and how to utilise data provided by specialised agencies. For the last part of the session, we worked on improving our PowerPoint skills, preparing upcoming presentations and choosing fonts, layout designs, colours and pictures to improve their aesthetic appeal. There is only a little over a month left until our upcoming field research assignments in Japan and in Malaysia. Once there, we will explain why we’ve travelled all the way from Nose for this project, and ask the residents about local problems and their opinions, and try to understand their way of thinking. We will work hard to prepare the best questions we can so we can make the most of this important opportunity. On Tuesday September 19th, we held the 18th SG focused-area lecture for the second-year students. From this lecture onwards, we will be guided through our research project by Yoko Inui, an associate professor of Mathematical and Natural Sciences at the Department of Arts and Sciences, Osaka Kyoiku University. Our project is entitled “Economic development and environmental destruction in Malaysia: Mangroves to shrimp farms; rainforests to plantations”. 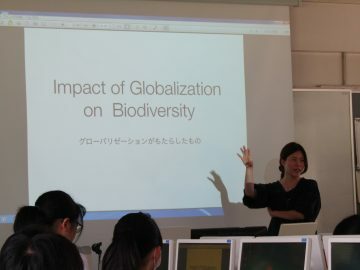 In the first half of the session, Prof Inui gave us a lecture titled, “The impact of globalisation on biodiversity”. We started by considering the definition of “global”. She explained to us that globalisation means universal uniformisation in a broad range of fields such as politics, economics, lifestyle, animals and plants. Our lifestyle has become dramatically more convenient thanks to the energy revolution: the shift from coal to oil, which enabled us to travel and send things all over the world faster and quicker than ever before. On the other hand, the negative effects of globalization pose serious problems: Prof Inui used the Ebola virus, red imported fire ants (RIFA), invasive species and other examples to illustrate her point. We learned the importance of recognising both the advantages and disadvantages of a situation, and will strive to do so as we work on our research project. In the latter half of the lecture, three groups presented overviews of their research presentations, with Prof Inui giving them specific feedback on the contents and areas to explore further for their upcoming field research. From now on, we will work on our research project thinking from the standpoint of consumers, asking how we can change our own behaviour and asking ourselves questions about our relationship with nature. We hope that this will inspire us to create some high-quality research. On Saturday September 16th, as our activity for the 1st SG focused-area lecture for the first-year students, we visited the Japan Mongolia Folk Museum in Tanto-cho, Toyooka city, Hyogo Prefecture, to learn about the history and culture of Mongolia. The bus carrying the nineteen SG lecture participating students and five teachers [five students in charge of Mongolian exhibition at the school festival] arrived at the museum a little past 11am. Once there, we had lunch, toured inside and observed displays with a view to collecting information for our school festival and research study next year. While at the museum, students got to experience the inside of a Mongolian ger for the first time, to see various Mongolian foods, and to try on brightly-coloured traditional clothes, deepening their hands-on knowledge of the country. 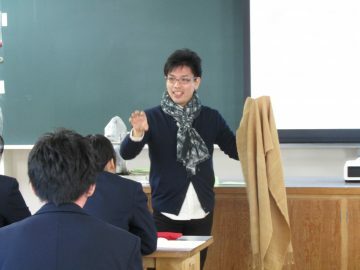 In the afternoon, Mr Lamar, a research student of the Graduate School of Language and Culture at the School of Foreign Studies, Osaka University, gave us a lecture on wildlife conservation, covering topics including storks in Toyooka city and endangered species in Mongolia. He explained various problems faced and possible solutions. 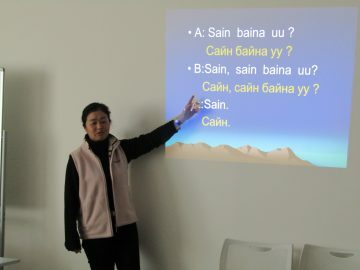 Next, we took part in a workshop on the Mongolian writing system. 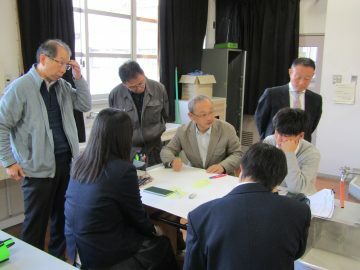 The workshop was hosted by Mr Toyo Mizutani from the cultural promotion division of Toyooka city. 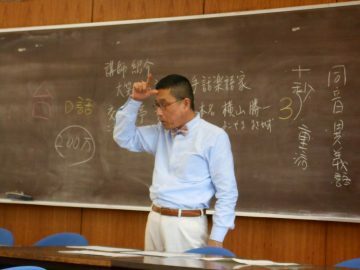 He taught us how to write ‘Japan’, ‘Mongolia’, and ‘Nose’ in the Mongolian alphabet. 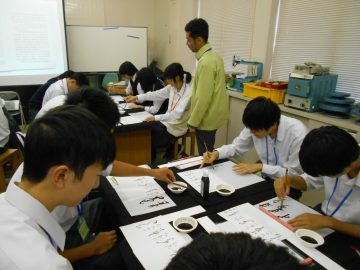 The students ground inksticks and practiced many times writing the letters using calligraphy brushes. They learnt well, and had written some beautiful words by the end of the session. At the upcoming school festival on 1st October, we will have a display of Mongolian items, and hold a craft workshop in which we will make little felt sheep, with the money raised going to a gender centre charity in Mongolia. We will present the proceeds to the centre when the students visit Mongolia in August next year. 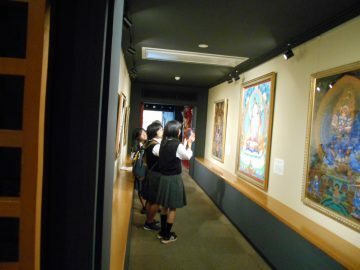 This visit to the museum will come in useful for our displays at the school festival, as we were able to see and experience Mongolian culture first-hand. This will also be useful ahead of the beginning of our research projects on Mongolia next year. 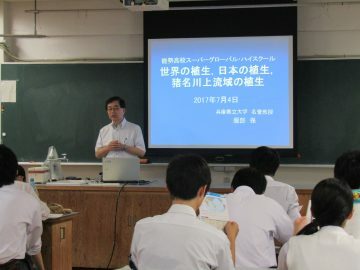 On Tuesday September 12th, we held the 17th SG focused-area lecture for the second-year students, welcoming once again as our lecturer Mr Ryoji Soda, Associate Professor of Geography at the Graduate School of Literature and Human Sciences, Osaka City University. 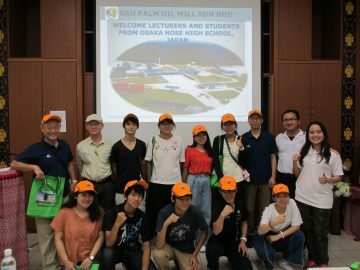 Following his theme from the 5th, 6th and 10th focused-area lectures, Prof Soda’s lecture and workshop today was on Malaysian Borneo’s rainforests and palm oil plantations, with a focus this time on Japan-Malaysia relations. In the first half of the lecture, we learned about two things, the first of which was Malaysia’s “Look East Policy”. Japan and Malaysian Borneo have deep relations stretching back before the Second World War. 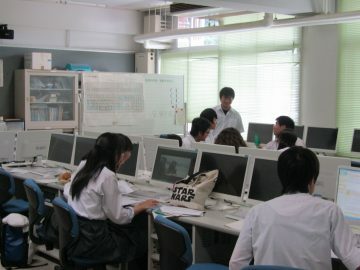 There are many Japanese companies and cemeteries in Malaysia, and many Malaysian students study abroad in Japan. These students often remain active in various related fields after coming back to Malaysia, making the most of their study and experience overseas. The Look East Policy aims to support this exchange of education and skills training between the two countries. 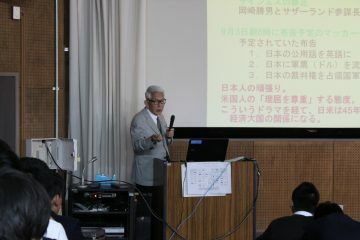 The other subject that Prof Soda spoke on is the underpopulated mountainous areas of Japan. 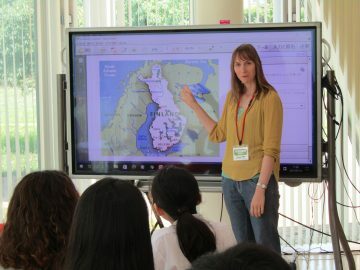 With the aid of graphs and maps, we learned in detail about the change in forested areas in Japan and Malaysia over time. The forest covering of Japan currently totals 67% of the country’s total area. However, forests are neglected in many parts, causing frequent landslides and floods. We will study this topic further with a view to including it in our presentation at Universiti Putra during our upcoming field study in Malaysia. 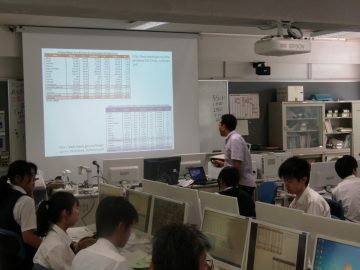 In the latter half of the lecture, we compared the forest classification of Malaysia and Japan, and thought about their characteristics and problems based on their historical and economic backgrounds. We also looked at graphs and maps of the forests of Nose Town, which gave us a valuable opportunity to think about how we can make use of the natural or high-value-added forest resources for regional revitalization in our area. 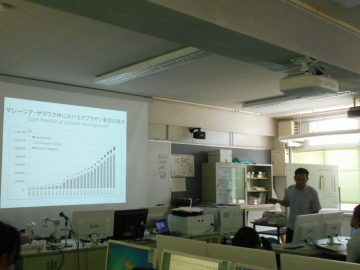 Mr Hatakeyama came all the way from Kesennuma city to deliver today’s lecture for us. 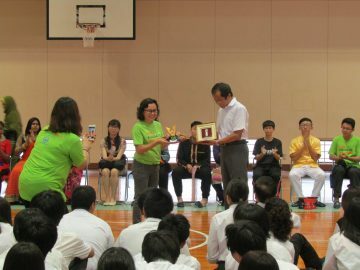 The theme was “The sea is longing for the forest: nurture your caring heart to nature”. In the lecture, we learned about the symbiotic relationships between oceans, rivers, and forests: the fulvic iron produced by fallen leaves is essential to ocean plants and animals. 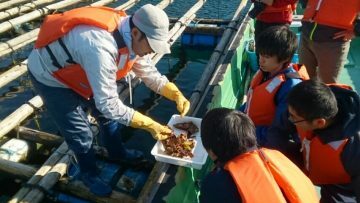 Mr Hatakeyama and his fellow fishermen have been planting trees in the upper Okawa river which flows into Kesennuma Bay. The Tōhoku earthquake caused catastrophic damage to Mr Hatakeyama’s oyster farm, but he was able to restart farming because he had been planting trees and taking care of the forest. 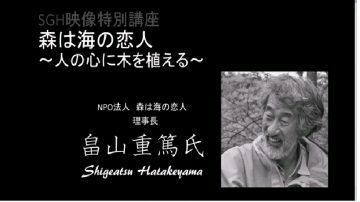 Mr Hatakeyama’s activities have received media attention, being featured on the NHK documentary series Professional. It also appears in school textbooks across all age ranges. 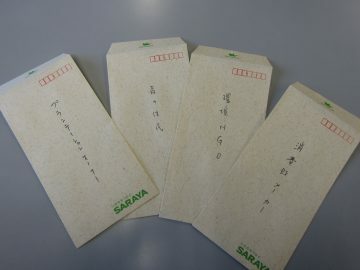 In high school English classes, students read an essay titled “The sea is longing for the forest”. Today’s lecture made us think about the role of the forests around us in Nose in maintaining the health of the rivers and oceans, and reaffirmed the importance we must affix to their sustainable future. During the 1st and 2nd lesson periods of an elective class in contemporary social studies on Monday September 4th, we held a special intensive SG basic knowledge lecture. This time, we invited Mr Takashi Kubota, a professor at the Graduate School of Public Policy, Ritsumeikan University, to give us a talk on his career. 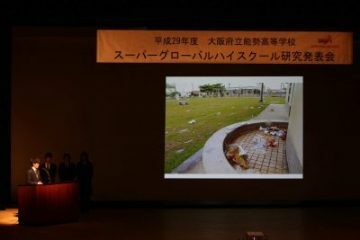 The main theme of the talk was restoration activities considered from a global point of view. 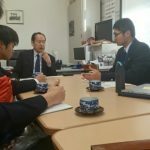 Mr Kubota told us a wide variety of stories from personal experience, on topics concerning government policy making, global experience, and restoration efforts after the 2011 Tōhoku earthquake and tsunami. Mr Kubota spoke about many stages of his life: his high school days, his visit to COP3* while studying at Kyoto University, why he decided to work at the Cabinet Office and his work experience there, his time studying at the University of Cambridge, how he contributed to the earthquake restoration, and about his work as deputy mayor of Rikuzentakata city at that time. 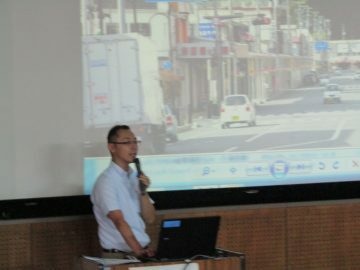 He explained to us about the situation in Rikuzentakata city before and after the earthquake, using photos and various case studies to illustrate his points. It was an opportunity for us to think about how tragic an earthquake truly is, and the huge effect it can have on us all. Japan relied on Singapore and the Philippines for their cooperation during the restoration works. This prompted us to think about the importance of globalisation and international cohesion on a practical scale. 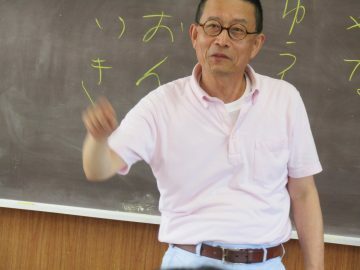 At the end of his lecture, Mr Kubota told us that having a global point of view does not mean being able to speak English, but rather having an understanding and caring for people who have different backgrounds and standpoints. On Wednesday August 30th, the visiting high school students from OISCA International Malaysian Chapter left their homestay houses in the morning. 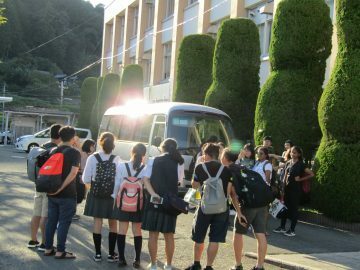 After reluctantly saying goodbye to the host families who had driven the students to the school, twelve Nose HS students on the SG focused-area programme and our exchange student Vale joined them, and they set off on the bus to Kyoto. Upon arrival, the Nose students gave their Malaysian friends a guided tour in English. 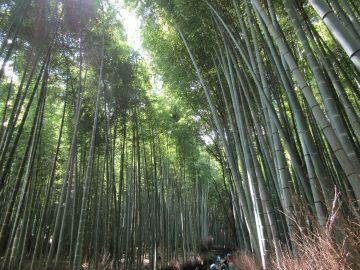 Students made groups and started their tour in Arashiyama, walking across the Togetsu Bridge, Nonomiya Shrine, and the spectacular bamboo forest. 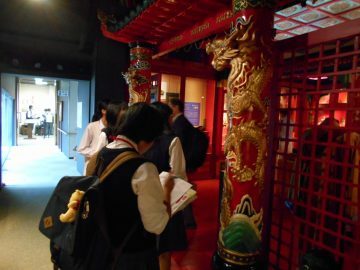 The Malaysian students and accompanying teachers looked very interested and seemed attracted to traditional Japanese culture and the nature of the area. Passing though Chion-in Temple, we had a pleasant lunch in Okazaki Park. 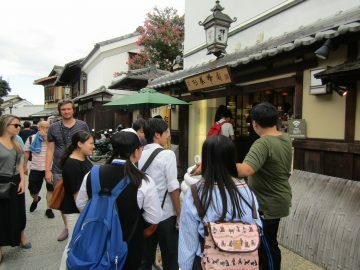 The groups then departed for the afternoon itinerary, visiting Yasaka Shrine, the Ninen-zaka and Sannen-zaka hills, home to many shops and restaurants, and the famous Kiyomizu Temple. Given the sheer amount of historical attractions and traditional and modern culture in the city, there was never going to be enough time for students to see all that they wanted, but they enjoyed everything that they did see a great deal. Finally, we took a group picture at the final destination Kiyomizu Temple and returned to Nose. The Nose students got off the bus at school, saying goodbye to the Malaysian students who were heading off for a night’s stay at Wapparu – an outdoor activity centre. These two days with the Malaysian students gave everyone involved a real experience of international communication. 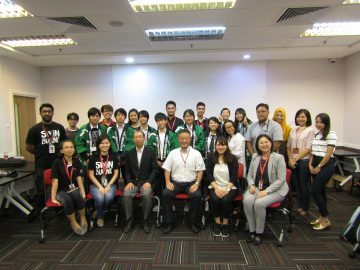 In the morning of 29th August, nineteen Malaysian high school students, three accompanying teachers and a guide arrived at Nose High School on a programme run by OISCA Kansai Training Centre. Thirteen of our SGS students and Argentinian exchange student Vale welcomed them during the 15th SG focused-area lecture, introducing themselves in English with information about school clubs they belong to and their hobbies. 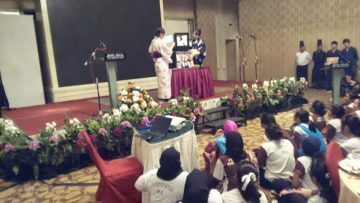 Mr Kuroda from OISCA Kansai made a speech, saying that he hopes this grass-roots cultural exchange will help to strengthen the relationship between Japan and Malaysia. 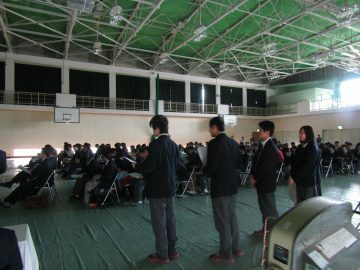 In the second class, we held a welcome event at the gymnasium. 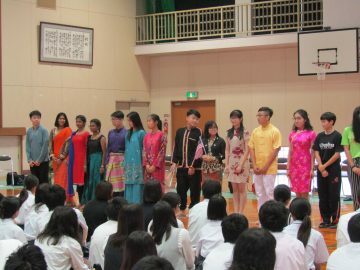 After hearing speeches by our school principal, the lead teacher of the Malaysian tour group, and the Nose HS student body president, there was an exchange of gifts, and we were treated to performances by students from each school. 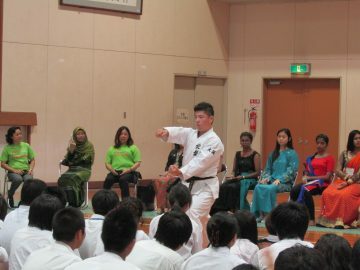 Nose’s Karate Club gave kata and tile-breaking performance, and the Malaysian students demonstrated Chinese martial arts and spinning-top performances. The demonstrations received a big round of applause. Our students in the audience were particularly excited to see our guests put on a multi-ethnic fashion show of traditional Malaysian clothes. 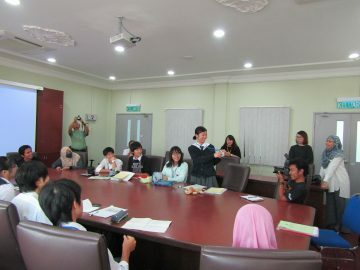 After the welcome event, The Malaysian students went to Sasayuri Gakuen School to have an exchange meeting with the elementary and junior high students there. They rejoined us in the afternoon, with our SGS students showing them around our agricultural fields. At the end of the day, the Malaysian students arrived at their host families’ houses. The host families were looking forward to offering Japanese traditional culture experiences and the students seemed to have enjoyed themselves a lot. One of them told us that she had enjoyed Nose HS so much that she wished she could stay longer as an exchange student. Like Mr Kuroda, we hope this programme will help nourish the relationship between the two countries and their people. On Wednesday 25th August, eleven Second Year SG focused-area students undertook fieldwork at the Arakidani Valley area of Nose Town, following a previous trip in February. 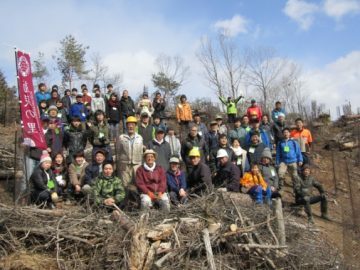 This fieldwork included wood trimming, and was held as a class of the programme “Satoyama life basic knowledge lecture course at Kikusumi no Sato”. 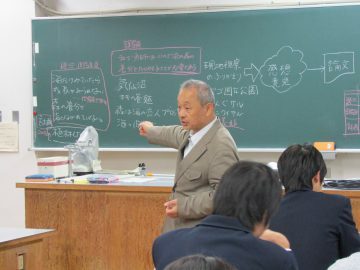 Our instructor was Mr Yoshitaka Kotani, the chief of Nose Satoyama Souzoukan Centre. Wood trimming is the act of removing unnecessary trees from the wood. It requires the participants to be aware of safety procedures, so we started with a tutorial to get us up to speed. Mr Kotani told us to always go into the mountain with a helmet and to be careful not to get tick bites. Then, we visited the location where we had planted trees in February to check how much the young plants had grown up. Most of them had grown to the height of 80cm, and showed good signs of life with green leaves. After our reunion with the saplings, we moved to the slope on the opposite side to start the wood trimming. 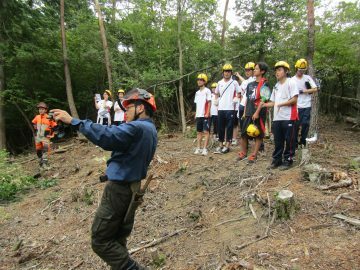 The students had a lot to take in, with a demonstration of correct chainsaw usage as well as learning how to cut the trees so they fall in the right direction, the point at which to make a cut, where to evacuate to when the tree starts falling, and so on. They all cheered at the end of the demonstration when a tall tree was cut down! To finish with, we had a feedback session in the foothills. 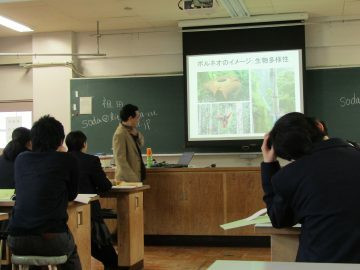 Our students learned about the difficulty of forestry and mountain care, and the dangers of wood trimming on an inclined mountain surface. 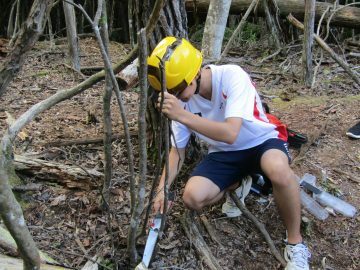 Despite those impressions, one student said that he wanted to try cutting a tree with a chainsaw himself. Though it was a very hot day, everyone returned to school healthy, having learned through hands-on experience about the value of hard work in preserving the environment. 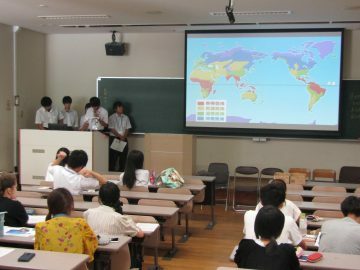 In the afternoon of 26th July, thirteen of our Second Year students who are taking the SG focused-area lecture visited Osaka University to give presentations and hold a workshop about their SG research topics. We were invited to the university by Ryoko Imaoka, an associate professor, and we held our activities in her liberal arts class “Understanding modern society: Mongolia and biodiversity”. 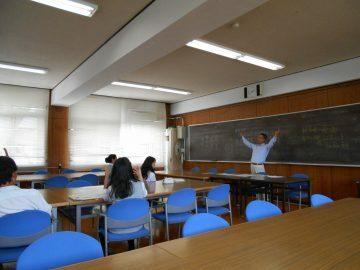 The class, which is taken by 37 first-year students at the university, was chosen because it is set up for various “active learning” training styles. 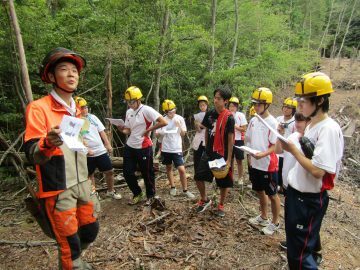 We were surprised to learn that nine of the students on the course also did SGH activities in high school. 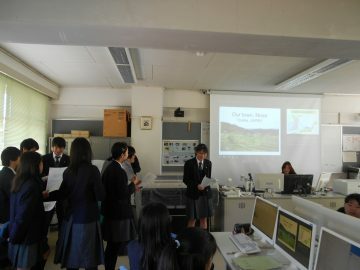 At the beginning of the class, the Nose HS students gave a presentation in English about our school and their SGH study. Their SG research presentations followed, on the three themes of rainforests, the relationship between palm oil and Japan, and the influence of prawn aquaculture on mangrove clearing. 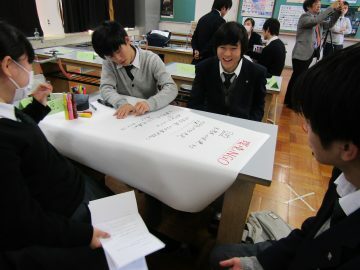 After the presentations, the students hosted a “stakeholder workshop”. It featured six different stakeholder roles: an international organisation, a local government, a university, an international NGO, a group of indigenous people, and a private company. 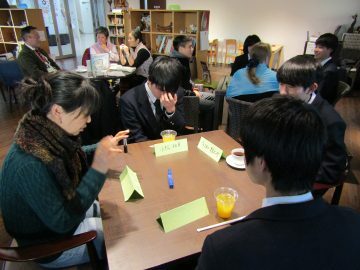 The students from Nose and the university mixed together to form groups, assumed roles, and held a discussion on topics of some social issues. At the end of the class, each group had a peer feedback session and shared opinions with the other groups. 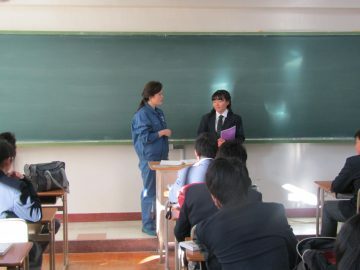 The Nose students, Prof Imaoka, and her teaching assistant (a Mongolian postgraduate student) moved to another room after the class to review the presentations and the workshop. 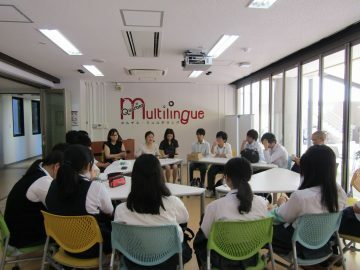 Our students said they were impressed by the university class and that they enjoyed communicating with the students. 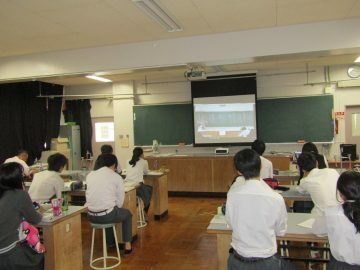 In the afternoon of Tuesday July 18th, students from the Second Year held a video meeting with students of Toyonaka High School as an SG focused-area lecture. 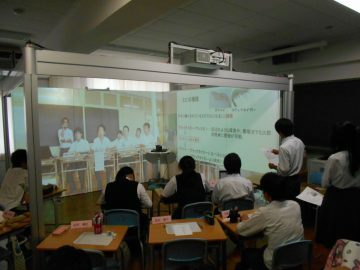 We made presentations in the “SmoothSpace classroom”, through a newly-installed remote network system named SmoothSpace by NEC. 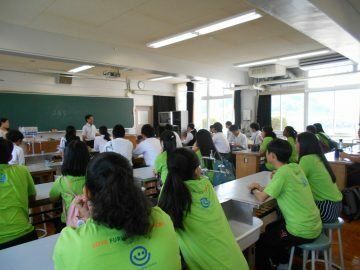 Since the day was also the open day for middle school students, all of the Third Years from Nose Junior High School came to see the presentation session. 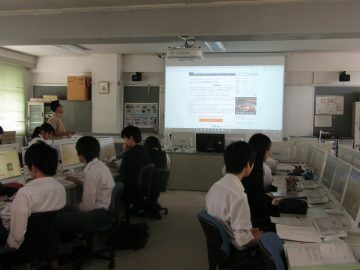 Our classroom was packed; we also hosted delegates from the Osaka Prefectural Education Agency, from Osaka Prefectural Council, and Nose Town Council. 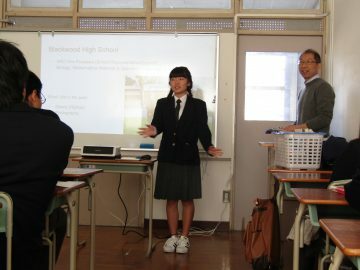 After listening to the speeches of the principals of both high schools, two students from Toyonaka HS and one from Nose HS gave presentations in English on each school’s SGH activities. 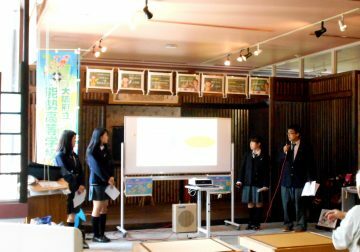 Then, this time in Japanese, groups from Nose HS presented on “Japan’s relationship to oil palm” and “prawn aquaculture and mangrove forest destruction”. 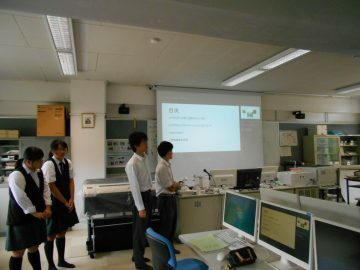 Groups from Toyonaka HS gave presentations entitled “promoting fair-trade” and “the morality of nuclear power plants with regards to energy security”. After the presentations, the students held Q&A sessions with the audience. At the end of the class, students gave their opinions of the SmoothSpace system. 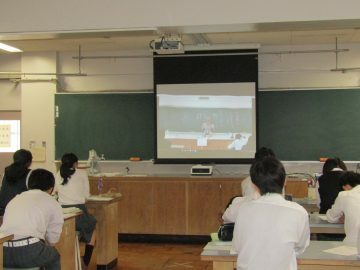 Some students said they did not expect such a large audience, and that it felt great to communicate with the other students as if they were just in front of them, and that they appreciated that the sound system didn’t lag at all. Some also found some points to improve on the presentations they had seen. 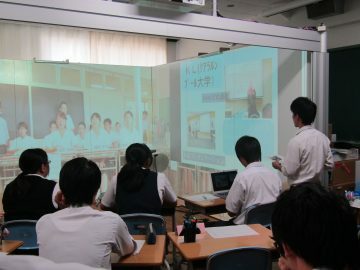 Some said that they expected the system to allow more communication in the future, not only during presentation sessions but also with the possibility of video-link lectures. This presentation session was a milestone of social activity on the SGH programme for both high schools, bringing about mutual learning from each other’s presentations and a new ease of communication. On Tuesday July 18th, we held the 18th SG focused-area lecture for the Second Year in the IT classroom. 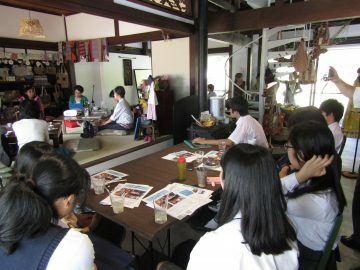 We rehearsed presentations for the Nose HS open day for Nose and Toyono area junior high students, which would be happening in the afternoon. The presentations of our two student groups are “Japan’s relationship to oil palm” and “prawn aquaculture and mangrove forest destruction”. 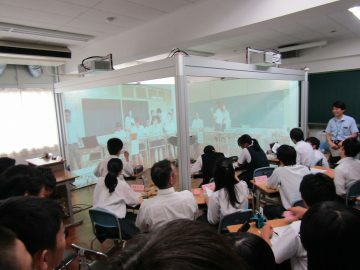 In the presentation session, we will be using the newly-installed remote network system SmoothSpace to allow us to hold a video meeting with students from Toyonaka HS. After the first rehearsal, we moved to the SmoothSpace classroom to have a dress rehearsal. Our students seemed quite excited at the prospect of this afternoon’s video meeting! 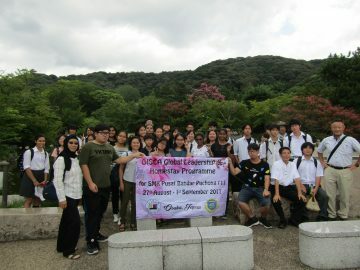 On Friday July 14th, the thirteen second-year students, along with Vale and Atakan, visited Tottori University of Environmental Studies. Vale is our long-term exchange student from Argentina and Atakan is an exchange student of Lions Clubs International, from Istanbul, Turkey. In the morning, we studied in the university’s English Village. The village is an English-only environment, so we felt a bit like we were in a foreign country. The teachers are from various countries: Ethiopia, Inner Mongolia, the Philippines, and Finland. 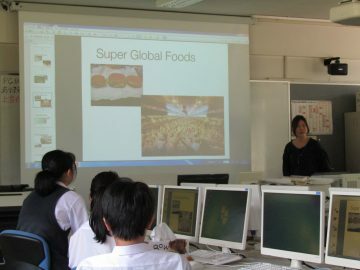 We were given a taste of each country through presentations, group discussions, and quiz sessions. We also had lunch in the university cafeteria with students there, allowing us to feel the atmosphere of the university. 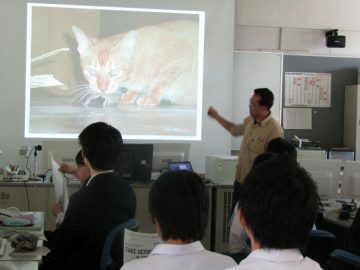 In the afternoon, we listened to a lecture, “Conservation and humans”, given by Prof Fumio Nakahashi. 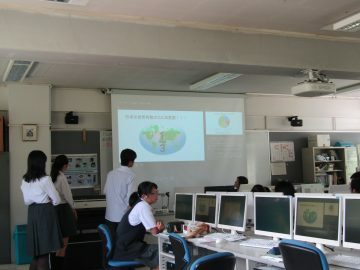 After that, our students gave a presentation on Nose HS and its role as a Super Global High School. 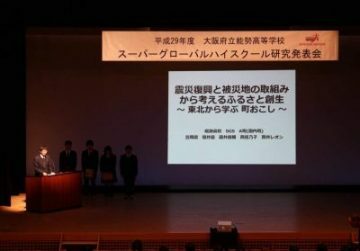 Four third-year university students from Prof Nakahashi’s seminar gave a presentation on regional revitalization by a collective of ceramic artists in Tottori, which was entitled “Mahari-no-sato”. 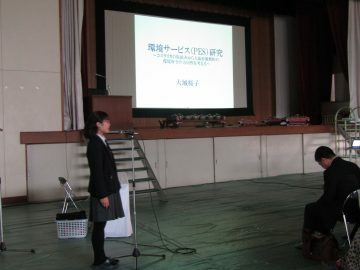 At the end, students from the university and Nose HS exchanged opinions about the presentations. We really enjoyed our day at the university, getting a feel for student life as well as seeing experienced presenters at work. 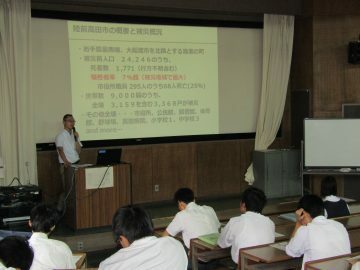 On Tuesday July 4th, we held the 11th SG focused-area lecture for the second-year students. 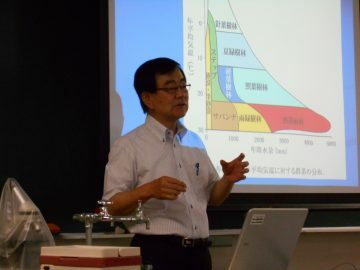 We invited Mr Tamotsu Hattori, honorary professor of the University of Hyogo, to give us a lecture entitled “Vegetation of the world, of Japan, and of the upper Inagawa river”. 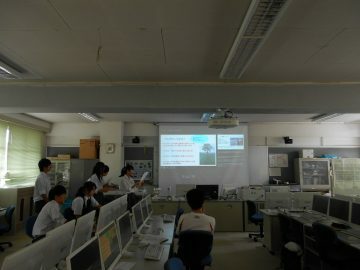 The lecture was based on information from the Osaka Green Trust, an organization formed to help protect nature in Osaka. 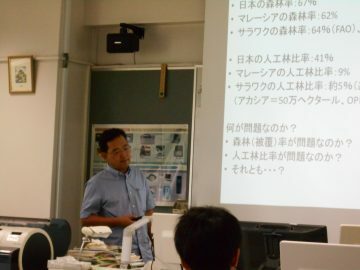 At the outset, Prof Hattori gave us advice for our upcoming field research in Japan and overseas, saying “in order to make a real comparison, it is essential to see and know the nature and its characteristics of the place you live before going to other parts of Japan or other countries”. We learned about vegetation around the world and in Japan. There are two kinds in vegetation: natural vegetation – which occurs naturally; and substitutional vegetation – that which has been planted by humans. We learned about natural vegetation classification by climate and its distribution, using a colour-coded world map. We also learned about the classification of Nose Town and Malaysia. We saw that there are various types of vegetation in the world depending on areas. Most of the existing vegetation in Japan is substitutional, but there are areas where you can find rare natural vegetation, such as the deciduous forests and Jio wetlands of Mt Myokensan in Nose Town, and the deciduous forests of Yoshikawa Hachiman Shrine in Toyono Town. 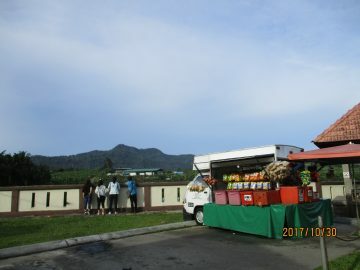 Our home town Nose and the Inagawa basin have a valuable natural environment full of history, culture, and biodiversity. We continue to be reminded of the importance of preserving our local area. 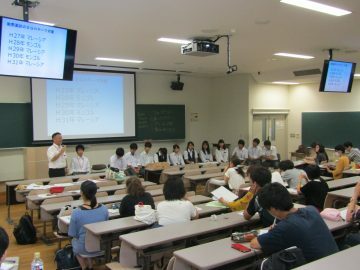 During the 5th and 6th lesson periods of an elective class on social welfare on Monday July 3rd, we held the 2nd special intensive SG basic knowledge lecture for thirteen students: nine second-years and four third-years. The theme, as last time, was “getting to know traditional Japanese culture through sign language rakugo”. 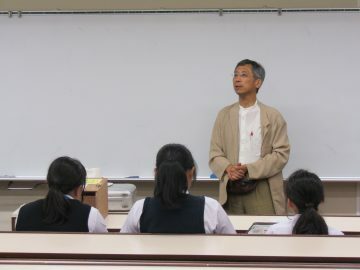 We again invited Mr. Masakazu Yokoyama, known onstage as Koyutei-rakusho, to deliver a lecture and hold a workshop. 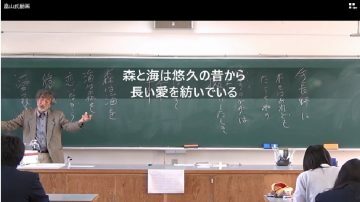 To begin, we reviewed what we had learned last time, and then played riddle games and learned sign language words used in the riddles, referring to a textbook called “Cho-san to Manabo”. We also learned how to fingerspell and introduce ourselves. Fingerspelling and sign language differ not only by country, but even between Kansai and Kanto. However, a willingness to communicate can overcome the differences and help us understand each other. Today’s class was a good opportunity to realize the possibilities for communication with people all over the world through sign language and humor. 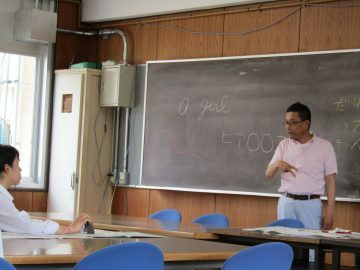 On Tuesday June 27th, we held the 10th SG focused-area lecture for the second-year students, welcoming once again as our lecturer Mr Ryoji Soda, Associate Professor of Geography at the Graduate School of Literature and Human Sciences, Osaka City University. Following on from his theme in the 5th and 6th focused-area lectures, Prof Soda’s lecture and workshop today was on Malaysian Borneo’s rainforests and palm oil plantations. 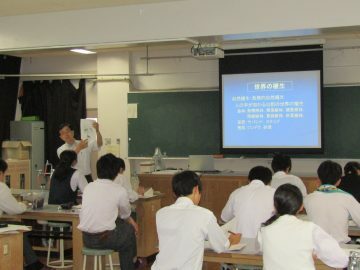 The first half of the lecture was given over to presentation practice. 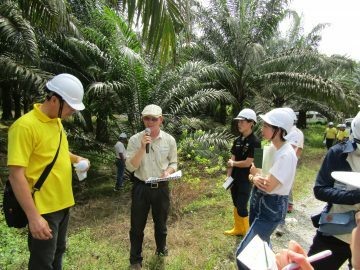 In July, students will split into three groups to make presentations on the topics of “oil palm plantations”, “the effects on mangrove forests of aquaculture of prawns”, and “the relationship between Malaysian rainforests and oil palm plantation”. Today, Prof Soda brought along Mr Takanari, a student from Osaka University, who is researching the satoyama environment of Nose with Prof Soda. 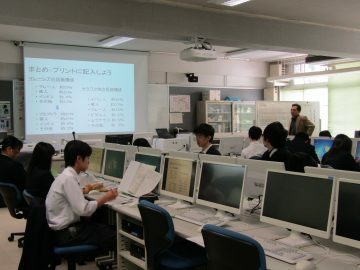 He taught our students practical tips on presenting such as how to make better slides, how to speak appropriately, and how to keep the audience’s attention. In the latter half of the lecture, we learned the difference between the increasing trend for small-scale, small-farmer oil palm planting, and the more established large-scale plantations. 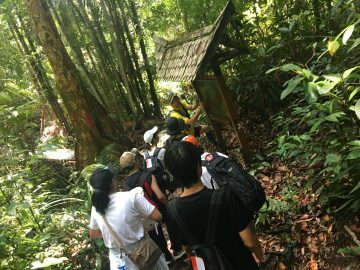 The fact that the gaps between small-scale farming areas remain as virgin forests, thus protecting their biodiversity, seemed to have made our students rethink how palm oil farming could develop sustainably in the future. 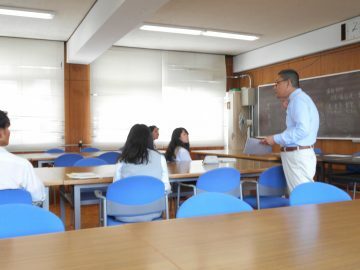 During the fifth and sixth lesson periods of an elective class on social welfare on Monday June 26th, we held the 1st special intensive SG basic knowledge lecture for thirteen students: nine second-years and four third-years. 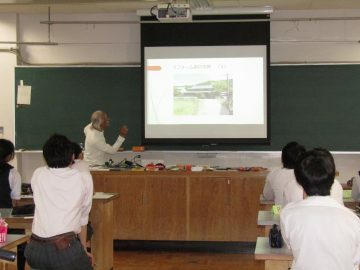 We invited Mr Masakazu Yokoyama to be our lecturer. Mr Masakazu is a performer of rakugo, a traditional Japanese comic storytell-ing art, and performs under his stage name Koyutei-rakusho. 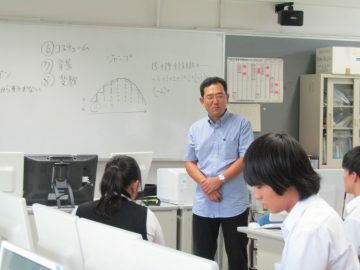 Mr Yokoyama is engaged in welfare activities through traditional Japanese culture, and holds events at places such as schools and welfare facilities so that people can have fun and connect with one another. 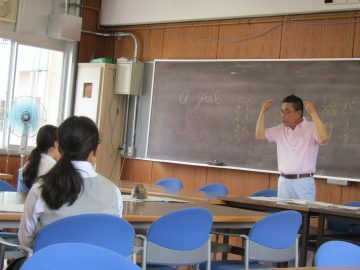 This time, he gave us a lecture titled, “Getting to know traditional Japanese culture through sign language rakugo”. 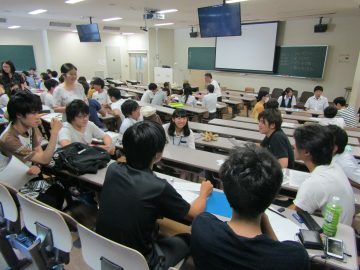 On Saturday June 24th, we held the SG focused-area lecture for the second-year students off-campus. 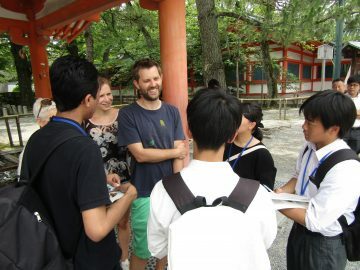 Eleven students went to Heian Jingu Shrine in Kyoto to try and help out the English-speaking tourists there. 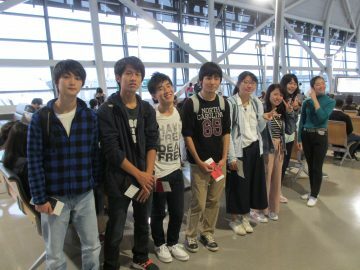 Students from Osaka International University ESS English club assisted us. 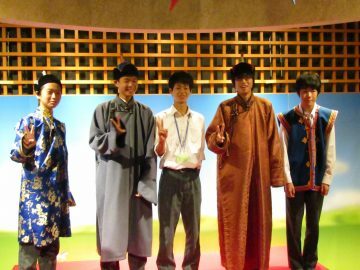 We divided into four groups, with each one consisting of two to three Nose HS students and two university students. We then approached tourists from around the world: the Netherlands, England, Spain, Lithuania, Canada, Australia, Taiwan and so on, who were kind enough to let us guide them. We felt nervous at first, but we did our best to fight through it. 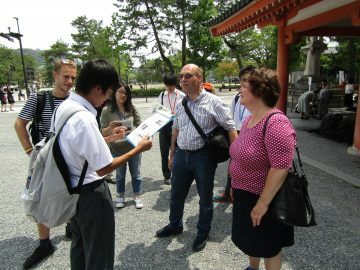 We showed them around, explaining about Heian Jingu Shrine in English. We gradually got better and were able to talk in our own words. 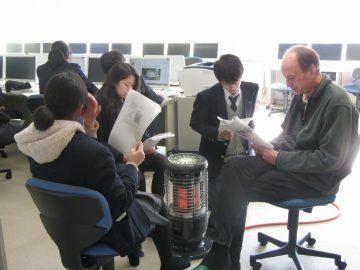 At the end of the activity, we received feedback from our supervisor, Mr Colin Rogers of Osaka International University. 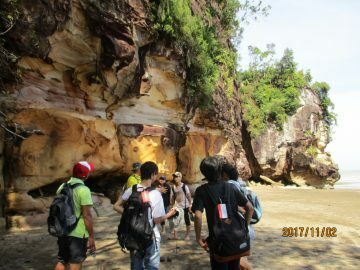 We guided twenty or more groups in total and are feeling much more confident in speaking English after this experience. On Saturday 17th June, ten of our second-year students took part as fair trade shop and café Espero held a special lecture called “Shapla Neer Caravan 2017”. 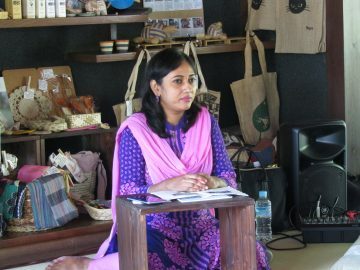 The students, as part as an audience of thirty, listened to a speech by Ms Mafza Parbeen from the Dhaka office of the NPO Shapla Neer, on the theme of “Challenges of housemaid girls in Bangladesh”. Ms Parbeen is working on the issue on child labour reduction among housemaids and is giving her speech around Japan this year. Ms Parbeen began the speech with some background information on Bangladesh, one of the least developed countries in the world. She then moved on to child labour, explaining that children are made to work because of the severe poverty in the country. It is estimated that 330,000 girls are working as housemaids, away from their parents and without attending school. Shapla Neer has three facilities in Dhaka for basic education, education about sanitation, and emotional counselling. They are working on parental awareness and advocacy toward employers, local communities and local governments. Our students were clearly interested in this topic and had a lot of questions after Ms Parbeen’s speech, which she seemed pleased about. It is perhaps the first time they have witnessed an example of an NPO which tries to change the social system itself, rather than simply donating goods to those in need. We hope this will broaden their horizons with regards to how they can help the international community. On Tuesday 20th June, we held the 9th SG focused-area lecture for the second-year students. As last time, we invited Tawa Masataka, Professor of the Department of Culture and History at the School of Humanities, Kwansei Gakuin University. Prof Tawa talked further about the lecture he gave us last time, “Environmental Destruction and Economic Development in Malaysia: shrimp farming and mangrove planting”. In the first half of the talk, we learned about how the Malaysians set up a shrimp farm, and how they breed and harvest the shrimp. Shrimp farming companies have cut down mangroves in wetlands, drawn water from the sea and built many ponds for intensive shrimp farming. In the affected areas, local people used to live a self-sufficient life by catching fish, utilising the rise and fall of the tide. 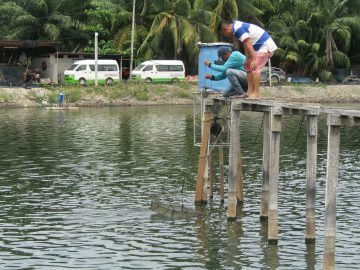 For many of them this is impossible now, as some shrimp farms use lime to alkalise their ponds, chemicals to exterminate harmful fish, and antibiotics to prevent disease. In the second half of the lecture, we learned how shrimp is processed and packaged, tak-ing a look at a joint Malaysian-Japanese fish processing company Prof Tawa had been researching. 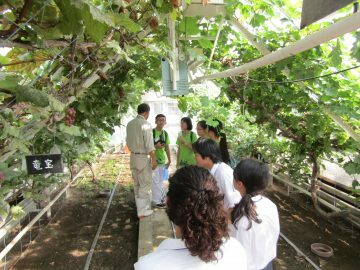 He told us about the importance of understanding all the processes from farm to plate, including growing, distribution, and consumption. He also stated his opinion that farmers and farming companies should operate a fishery responsible in all those processes. 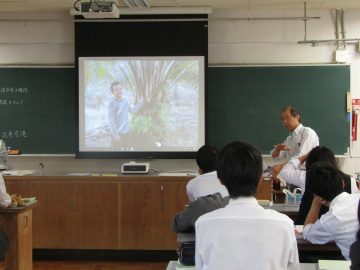 From today’s lecture, we learned about disappearing mangroves, shrimp farming techniques, and also processing, distribution and consumption of shrimp, and how this is connected to environmental issues and economic activities both in the area and internationally. On Tuesday 13th June, we held the 8th SG focused-area lecture for the second-year students. Our lecturer today was Tawa Masataka, Professor of the Department of Culture and History at the School of Humanities, Kwansei Gakuin University. Prof Tawa specialises in fisheries; his lecture was entitled “Environmental Destruction and Economic Development in Malaysia: shrimp farming and mangrove planting”. 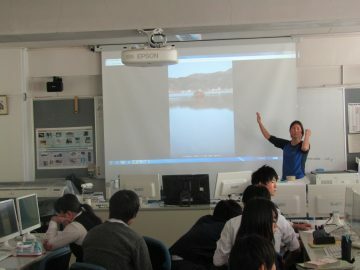 Mr Tawa explained his subject through marine products which connect people and places. 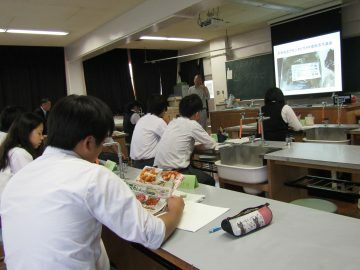 In the first half of the lecture, we learned about the manufacture of processed seafood products, especially farmed shrimp. The shrimp we usually eat is black tiger shrimp and Vannamei or whiteleg shrimp, which is euryhaline and can be caught in warm waters. In the latter half, we learned that the disease-resistant Vannamei shrimp, which is native to South America, has become popular in commercial farming in Southeast Asia as substitute for black tiger shrimp which is more vulnerable to viruses. 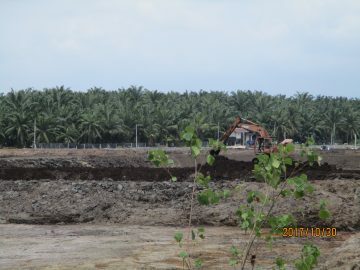 Mangroves have been cut down to construct culture ponds, and this environmental destruction has become a serious issue in the area. Japan is one of the countries that consume the most shrimp, and it was striking for us to think about how big an effect Japan has on environmental issues in Malaysia. The lecture today was very enlightening. We learned how shrimp farming has developed, which enabled us to further define the focus of our study for our upcoming field research in Malaysia. For the first and the second classes on Tuesday 6th June, we held our Second Years’ 7th SG focused-area lecture for the Super Global Study class. We welcomed as our lecturers Kazuko and Teruhisa “Terry” Saito, a couple who run the fair trade shop and café Espero in Nose Town. The theme of the lecture was “What is fair trade and why is it needed? Our path to opening Espero Nose”. Mr and Mrs Saito, who have experience of living in Indonesia and running a fair trade shop in Minoh, moved to Nose and opened Espero in a renovated 100-year-old traditional Japanese-style house in the Jioh area, in January 2017. 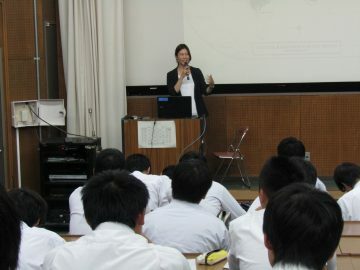 To begin the lecture, Kazuko Saito explained to the students about fair trade, using coffee as an example. She showed us some of their products to help explain some features of fair trade. She then told us about Shaplaneer, a Japanese NGO working in Bangladesh, and about an event that the NGO will be holding at Espero on 17th June which some of our Second Year students will be participating in. Finally, Terry Saito talked about how they went about renovating the old house into the shop they run today. Mr Saito says that such renovations are an effective way to encourage people to move to Nose, and to promote revitalisation and redevelopment. Today, the students heard that a fair trade shop in a small town can help to contribute towards fighting international issues such as poverty or child labour, as well as working to solve local issues such as population shrinkage. On Tuesday 30th May, we held the sixth SG focused-area lecture for the Second Year students. Following on from the fifth SG lecture, the topic of the day’s activities was the rainforests and palm oil plantations of Malaysian Borneo. 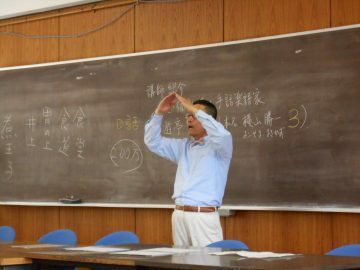 We were instructed by Mr Ryoji Soda, Associate Professor of Geography at the Graduate School of Literature and Human Sciences, Osaka City University. 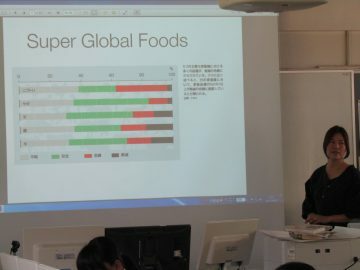 In the first half of the lecture, we made charts based on government statistics on the import of palm oil to Japan and export of palm oil and prawns from Malaysia. In the latter half of the lecture, students discussed the development of the palm oil plantation industry in Malaysia, and assessed the merits and drawbacks of the industry. Students also learned the positions of various sectors on palm oil plantations: the government, plantation companies, trade and food processing companies stand for the industry; local residents and environmental NGOs are against it. 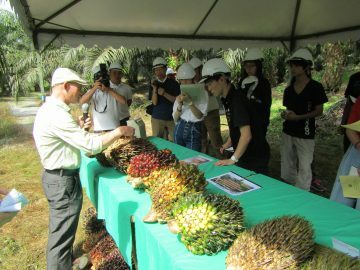 The situation is made more complicated by the rising number of small farmers growing oil palm, and conservation efforts are hampered by difficulties involved in satisfying the many parties with vested interests. Today’s lecture and workshop was a great opportunity for the students to observe data analysis and see some deeper research on palm plantation issues, and to understand the relationship of stakeholders in solving these issues. They will have ample opportunity to use these methods on their own theme research. 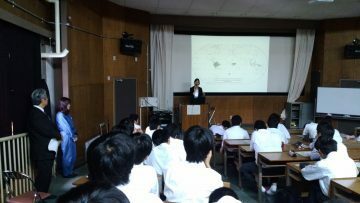 During the fifth and sixth classes of Monday 22nd May, we invited Ms Sanae Nakajima, representative director of the NGO “Free the Children Japan”, to deliver the First Years’ 1st Super Global basic knowledge lecture. Free the Children Japan is the Japanese branch of the international association which works to regain children’s rights in the face of severe circumstances such as starvation, civil war, and child labour. 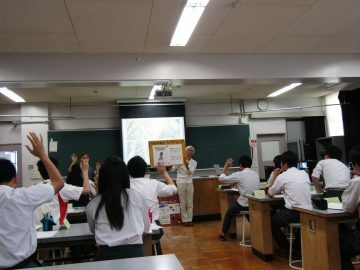 During today’s lecture, Ms Nakajima organised a game. She gave five student groups each a mission to complete. Unbeknownst to us, each mission had a different level of difficulty. Therefore, some groups completed their missions easily, while others struggled and failed. On revealing the true nature of the missions, Ms Nakajima told us that the difference in hardness serves to symbolise the economic gap among children across Japan and the world. Achieving their mission in this game was akin to gaining independence in a local area. 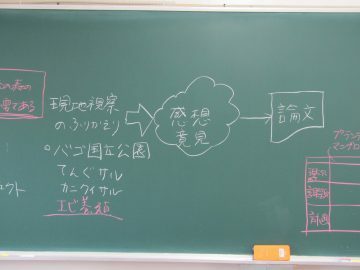 After the explanation of the meaning behind the game, the students did group work to discuss and learn more about what the “game” implied with regard to the real situation of children around the world. This lecture was a great opportunity for students to learn about the harsh existence of children suffering in various ways across the world, and to consider what they can do to help alleviate the issue. 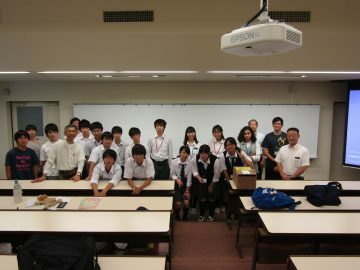 On May 18th, we held the 5th SG focused-area lecture for the second-year students. 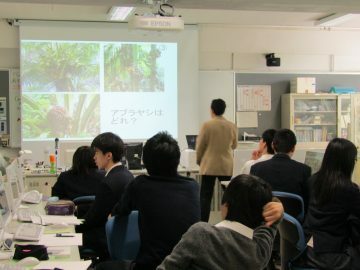 In a continuation of the 2nd SG focused-area activities, the topic of the lecture and the workshop today was Borneo’s rainforest and palm oil plantations, and was co-ordinated by Ryoji Soda, Associate Professor of Geography Section, Graduate School of Literature and Human Sciences, Osaka City University. For the first half of the lecture, we started by reviewing information about Malaysia which we had learned in the last lecture, and overviewing Malaysia’s colonial history. We then heard a little about the state of Sarawak – the destination for our students’ upcoming overseas research trip – and the palm oil plantations there. 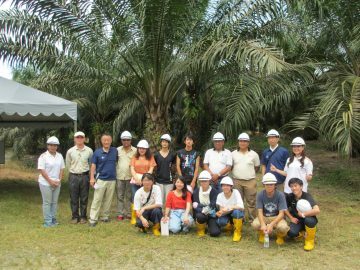 Students went online to research the geographical situation of oil palm plantations, aquacultural sites for prawn farming, and locations of oil-producing factories and workers’ residences. They realised how big those industrial areas are, with the help of a size comparison with Nose Town. Student then made presentations in groups about the issues raised by palm oil plantations such as a decrease in the number and diversity of animals and plants, destruction of ecosystems, terrible working conditions, and water and soil pollution. 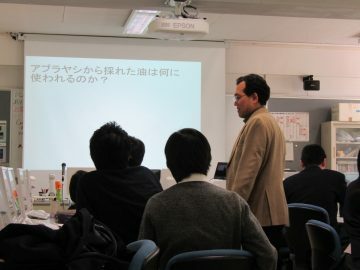 In the second half of the lecture, Prof Soda taught students methods to find news articles and statistical information related to Japan and Malaysia on the internet, in order to help deepen their knowledge on our topic. Students had some time to practise using these methods. We hope that this will be one step towards understanding the importance of forming their own ideas with reasoning based on accurate data and information. 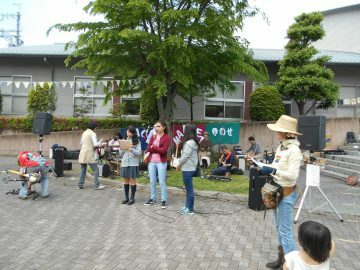 On May 14th, Sunday, our Super Global Study class students – twelve from the second year, five from the third year, and one exchange student – participated in Peace Market Nose 2017, which was held in the Nose Municipal Joruri Theater Hall. 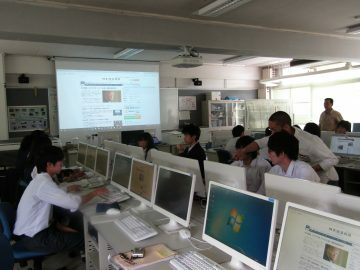 The second-year students started working at 9 am. They assembled a Mongolian ger which had been made at Nose High School, and prepared a display showing our school’s history of international communication and SGH activities. When the Peace Market opened at 10:30, some of our second years played the role of MC for performances on the main stage. Over at the main stage, we had a short time for allotted to use as we liked, so our Argentinian exchange student Vale introduced herself in Japanese, and introduced Nose HS in Spanish. 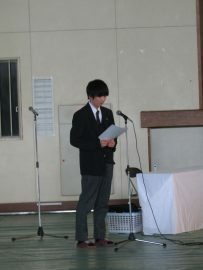 One of our students who has been to Costa Rica as an exchange student translated Vale’s speech into Japanese. Some of the other second year students, along with Vale, talked about our SGH activities on the open-air stage. The third-year students gave two showings of their field research presentations on Mongolian beekeeping. 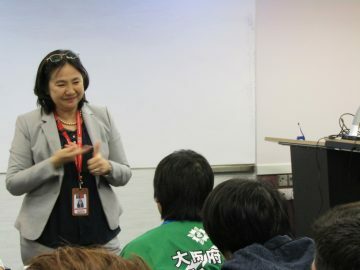 Since these sessions were held in a corner of the lobby of the theatre building, the students enjoyed some close-up communication and a relaxed Q&A session with their audience. Our students also helped the organisers by conducting questionnaires. Some even played the role of the Peace Market’s mascot, costume and all! 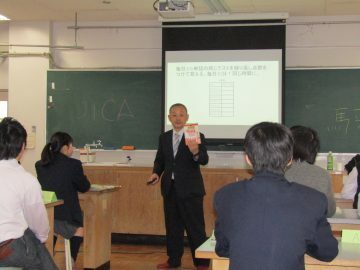 At the beginning of the lecture, Mr Saito gave us some language-learning tips based on his experience using English in Costa Rica. 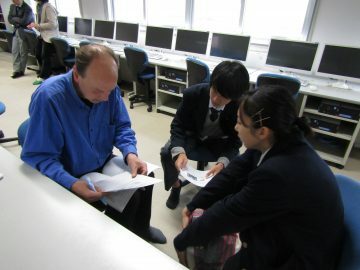 He told us that “getting familiar with English” is key, and said that “experiences and dedicated time” are necessary for improving your English skills. Finally, our lecturer gave us a quick test from the English vocabulary book “Peanuts.” We hope that our students learned something about the importance of continuous effort in learning a language. 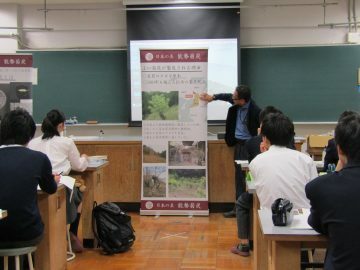 On the 2nd May, we held the third SG focused-area lecture for the second-year students along the theme of “rural environment conservation and Nose kikusumi charcoal”. 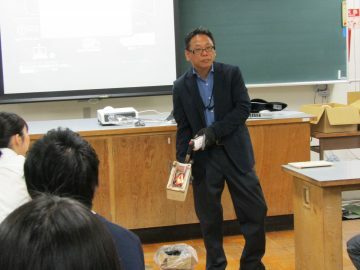 To deliver the lecture, we welcomed Mr Yoshitaka Kotani, skilled artisan and chief of Nose Satoyama Souzoukan, a traditional Nose kikusumi charcoal workshop. Kikusumi is a kind of wood charcoal with chrysanthemum-like pattern on its surface. Kiku is Japanese for chrysanthemum. 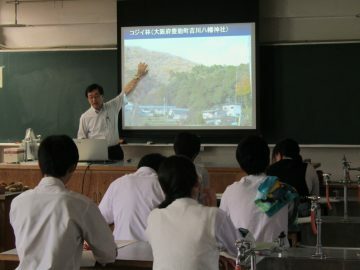 The topic of the first class was Mr Kotani’s satoyama rural environment conservation activities, and the role played in them by kikusumi charcoal. He told us of how he applied for a subsidy granted to projects for rural agriculture and fishery promotion, with a focus on local revitalisation. He believes that the Japanese alignment with nature could be a key to solving some global issues surrounding the achievement of sustainable societies. 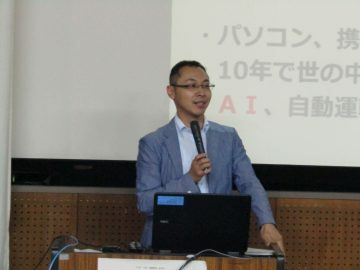 According to Mr Koyama, with the power of informatics technologies allowing people to reach information from the far ends of the earth, young people living in rural areas can find new value in their local culture and communities instead of focusing solely on urban areas. We also watched three short videos recorded in 2012 which helped demonstrate our lecturer’s activities. 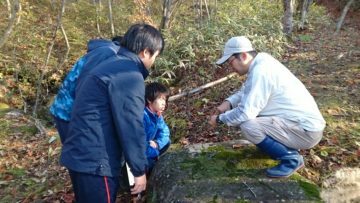 In “Japanese Satoyama” by TV station BS Premium, we learned more about the culture of the natural satoyama lifestyle. The second video, NHK Kyoiku TV’s “Shumi Do Raku”, illustrates the relationship between Japanese cha-no-yu tea ceremony culture and Nose’s kikusumi charcoal. From the last one, BS Asahi’s “Eco no sahou” [the way of being ecology] by BS Asahi, we learned how natural environmental circulation was created with charcoal used for bio-energy. 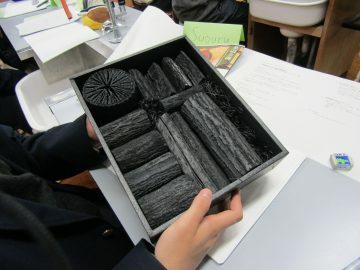 At the end of the lecture, we spent some time burning kikusumi charcoal to help students to feel the sensation of the sound, smell and light of a natural product, and to consider the achievements and possibilities of a recycling-oriented society. 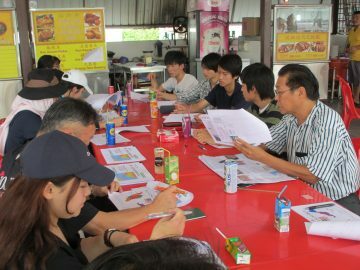 On 25th April, we held the second SG focused-area lecture for the Second Year. 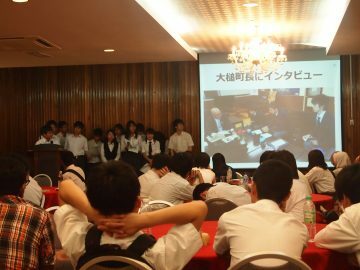 Participating in the lecture were fourteen students, including one exchange student. 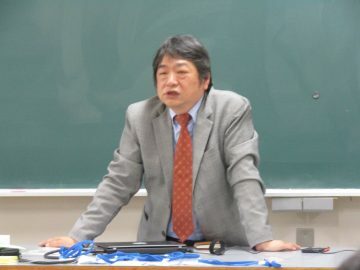 To deliver the lecture, we welcomed Mr Ryoji Soda, Associate Professor of Geography at the Graduate School of Literature and Human Sciences, Osaka City University. The topic was the rainforests of Borneo and palm oil plantations. 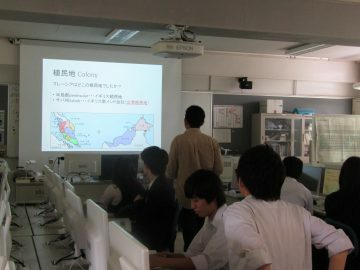 In the first class, we started by reviewing general information about Malaysia which we learned during the last lecture. Then Mr Soda talked more about Borneo, with a focus on our students’ planned research destination of Sarawak. Sarawak is home to more than 40 ethnic groups with diverse religions, with Malays making up around a quarter of the total population. We also learned about the flora and fauna of the state. We saw pictures of proboscis monkeys, birds of paradise, and rafflesia, illustrating Borneo’s biodiversity. 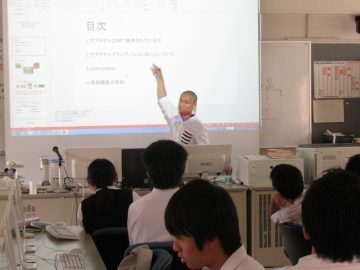 In the second class, Mr Soda held a workshop. After hearing that palm oil usage in detergent, snacks and cosmetics is increasing year by year, resulting in more and more rainforests being cleared for plantations, our student groups discussed the controversial points of oil palm production. 2017 is Nose High School’s third year as a Super Global High School (SGH). This year’s SG focused-area lectures for the second-year students will be held during the first and second class periods on Tuesdays. 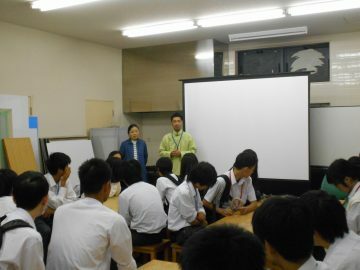 The teachers in charge are Mr Togashi and Ms Ichihashi from the English department, and social studies teacher Mr Yamauchi. This year’s SG lectures will have the theme “Malaysia’s economic growth and the destruction of its environment”. We will be inviting lecturers such as Prof Yoko Inui from Osaka Kyoiku University, and Prof Ryoji Soda from Osaka City University. 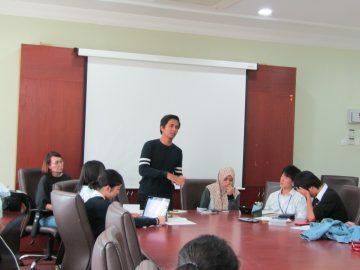 On 18th April, we had the very first SG focused-area lecture with the participation of fourteen students, including among them one exchange student. 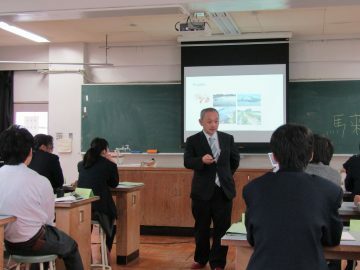 In the first class, our vice principal, Mr Uchida, delivered the orientation explaining the SGH programme and the content, schedule and purpose of the SG lectures. 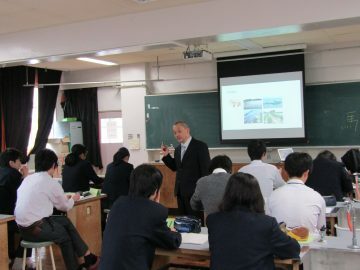 In the second class, Mr Yamauchi lectured on some basic information about Malaysia, including its demographics, religion, geography and history. 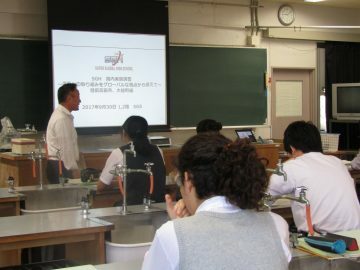 Through this lecture series, our aim is to develop the students’ teamwork and leadership abilities, as well as increasing their knowledge by offering topics surrounding global and local issues, which will help them to discover and analyse how seemingly distant worldwide social problems relate to their own lives. To these ends, we, the staff and students of Nose High School, will strive to both teach and learn from each other as we head into the new year.